This is a “quadrat”, or measurement grid, to estimate percent cover in a one-meter area. 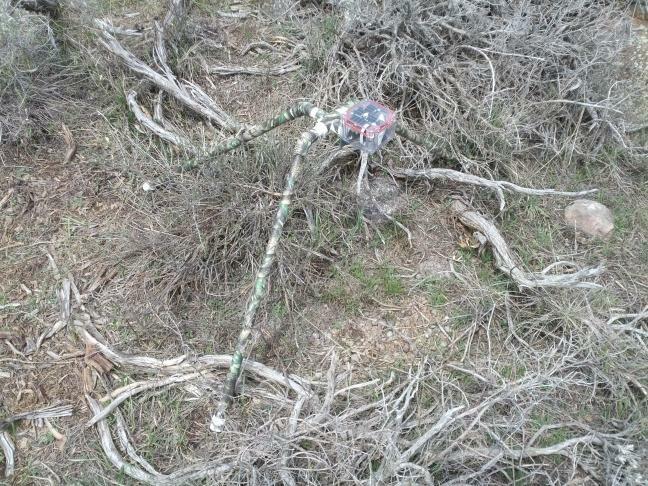 You use it in vegetation surveys. This design is improved from the instructions originally published March 2001. When helping users, I thought people would sometimes build the old design, which costs less. However, they always went for this new one, for ease of use. When put together, the frame makes a square 1 meter on each side. The four sides (or “legs”) are marked in 1/10 meter (10 cm) increments. This makes it easy for you to mentally grid up the ground inside the square. The pink dashed lines in the picture above are your imaginary lines. As you see, these divide the whole square into 100 small squares. Each small square is 1% of the whole square. 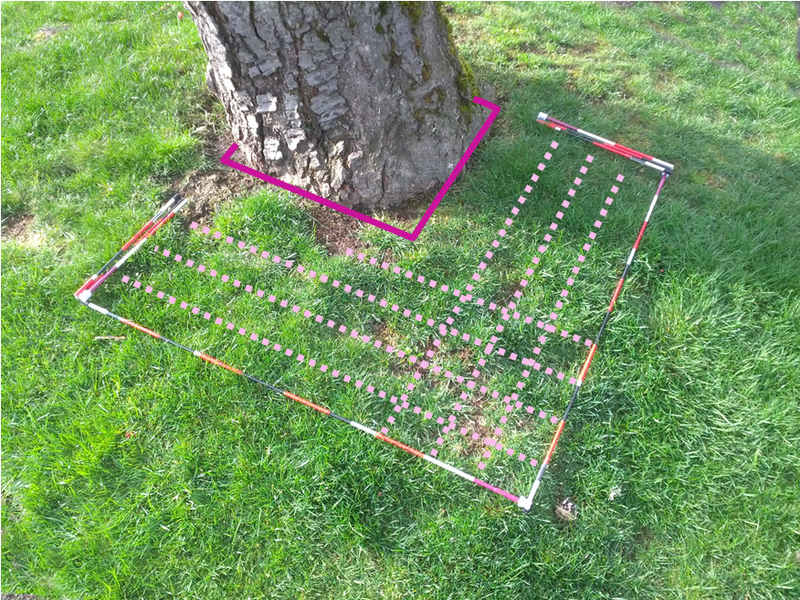 In this example you might estimate the tree trunk takes up about a quarter of the whole square, 25% (purple solid line), or a little less. The exact way you do this would depend on your protocol. Now, this is not about the protocol. This post is about building the equipment, so you can go out and do your study. In a day’s work, you may move the quadrat many times. You’re constantly taking it down and putting it back together. So the leg ends attach by Velcro. They come apart easily. To assemble, you just fish the legs through the brush, touch the ends, and they stick. One end of each leg is visually distinct from the other, so you can see at a glance which ends will connect. You don’t have to fuss, trying them all different ways. Legs one meter long may not seem like much in open space. However hiking with them through brush, hauling them around in a crowded rig, or putting them through airport checked baggage would be awkward. In this design, the legs are collapsible. They are made of the same ultralight rods as dome tent poles. They fold up to about one third their length. The whole frame becomes a small lightweight bundle, easy to pack and carry. The jointed frame also means that, if there is some obstruction on setup (like the tree trunk), you just fold part of a leg out of the way. As you read this post, if you decide these instructions are too complicated to do yourself, I offer ordering information at the end. Explain that you want sections that will be one meter long, and will fold up in thirds. If TT can look up previous orders from me (rickshory.com) you can order the same thing. If you’re really pinched for cash, ask if they will sell you the raw materials, the fiberglass pole sections and the shock cord. You can save some money by putting in the labor to assemble them yourself. 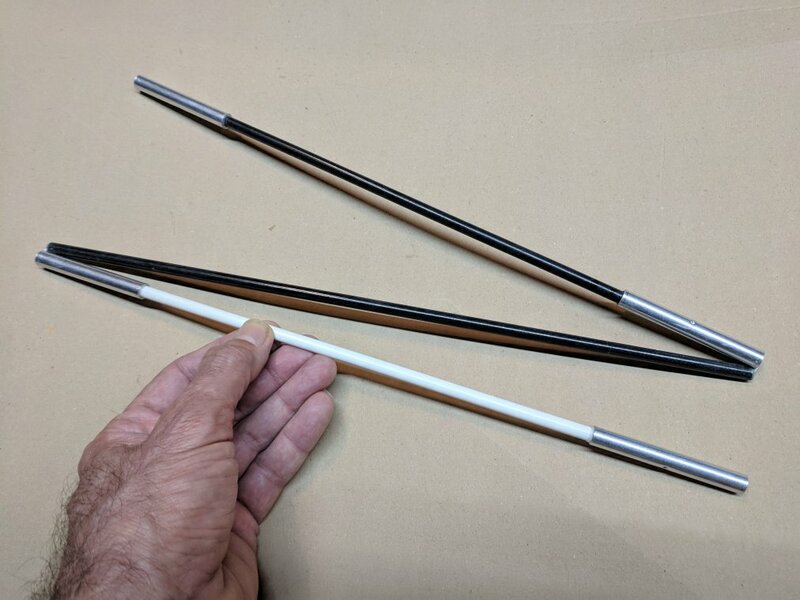 TT typically makes the poles with one white end, and the rest black. This is all to the good. It makes the two ends visually distinct. If you are assembling them yourself, note how they will finally fold up, to be most compact. In order to apply the colored bands, mark the poles at 10 cm intervals. It is rather tedious to make the marks one at a time, each successively 10 cm from the last. 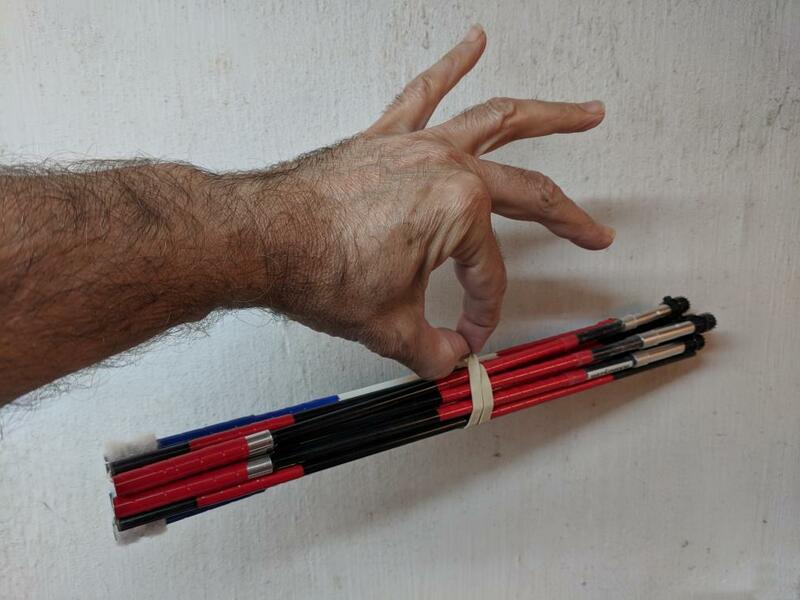 Below is an easier technique. 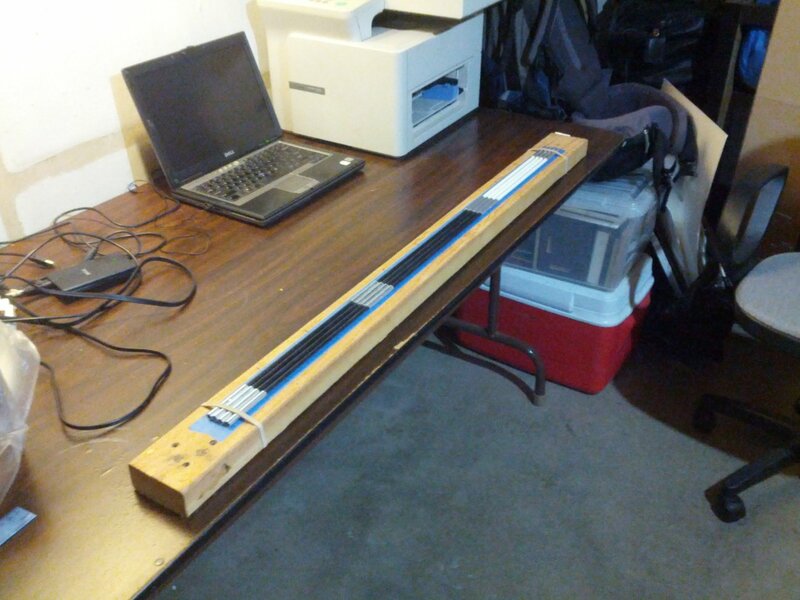 Lay out a strip of tape, such as blue painter’s tape (as shown below), or masking tape. Use tape at least two inches wide, or improvise from narrower strips laid parallel. Two inches will give you enough width to arrange all four poles side by side. 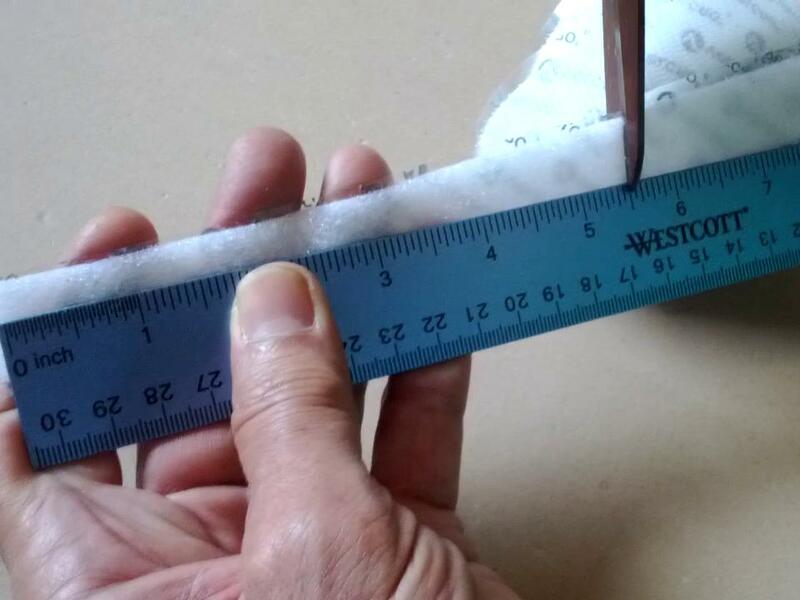 If you plan to do this a again, you can make a jig by applying the tape to a 4-foot-long board, as shown. Then you can put this arrangement away between uses. If you are only going to do this once, you can put the tape directly on a table and discard the tape when done. 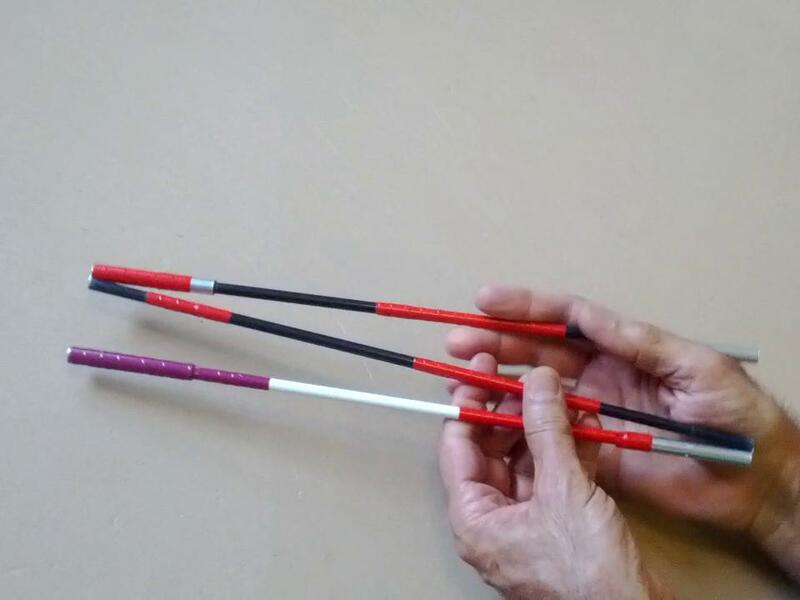 When you lay out your poles, the ends may not align exactly. However, having the whole meter length at once lets you get them as even as possible. 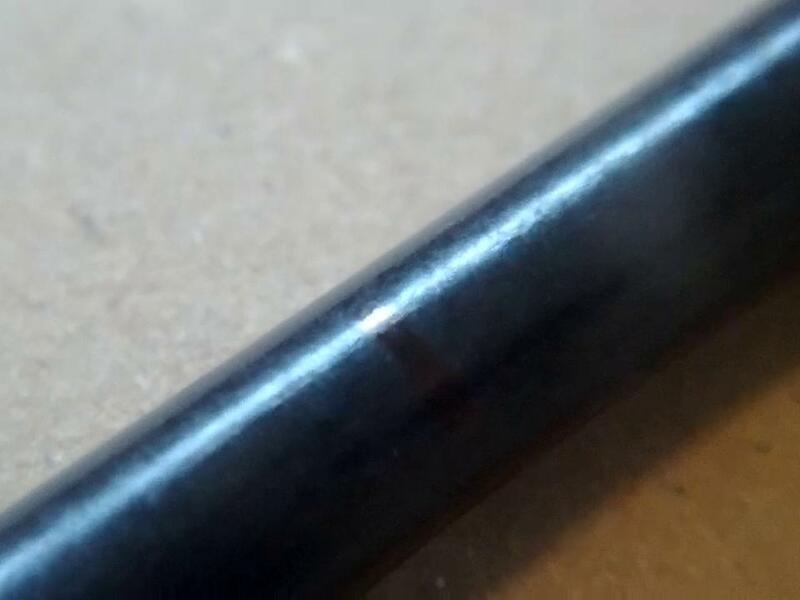 The ends may go part of a centimeter beyond the furthest marks, but this is OK. It’s well within tolerance. Now, you can mark all four poles at once. Where marks fall on the white and silver sections, you only need a tiny dot to find the location later. However, on the black sections, the mark will only appear as a faint glint of a slightly different color quality (this is ink from a black Sharpie pen). Although you may have to hunt a bit for these marks, this is still quicker than, say, sticking temporary bits of tape to mark the places. Below is an example of a pole after the color bands are on. I use two easily distinguished colors, the “main” color (red here) and a “tip” color (violet in this example). 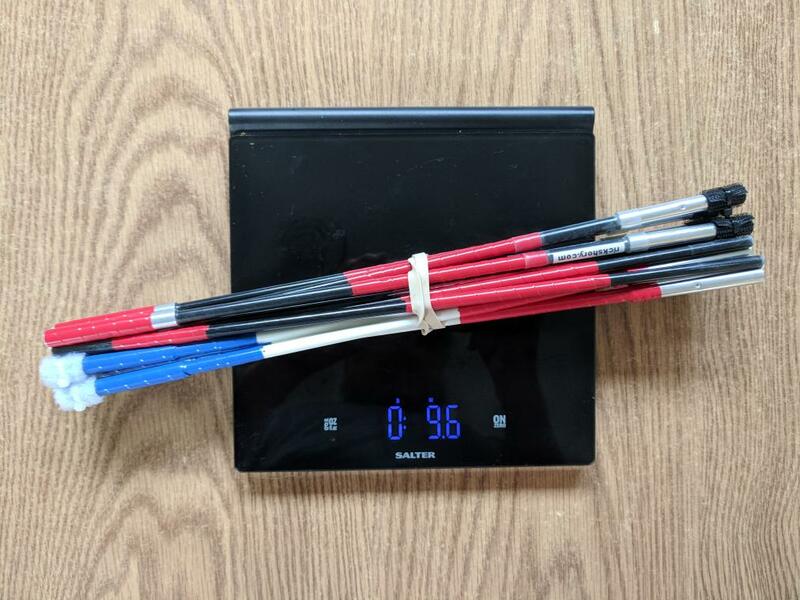 The widths of the bands help visualize percent cover, but the colors themselves help keep you from losing the poles in the woods. The main color is most important because there’s more of it. I use a color that will stand out in the environment. In leafy green vegetation, a hot color like red, orange, or yellow would be good. However, in a red desert, I might use violet for the main color instead. You may not realized how easy it is to lose equipment like this until you are actually out in the field. 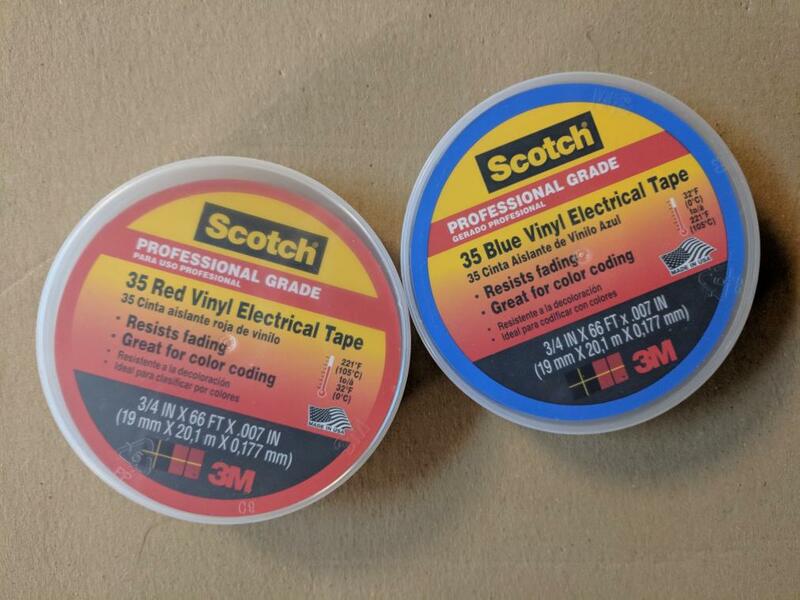 The material to make the color bands is vinyl electrical tape. Various colors are available at most hardware stores. Bright fluorescent “DayGlo®” tape would be better, but I have never found it in a field-durable form. There is a product called “gaffer’s tape” in fluorescent colors, but this is much like masking tape, and would not last long in field work. I put the tip colors on first, to avoid mixups. You want the two ends of each pole readily distinguishable from each other, but all four poles the same. It’s easy to get confused if you start applying the color bands at random. 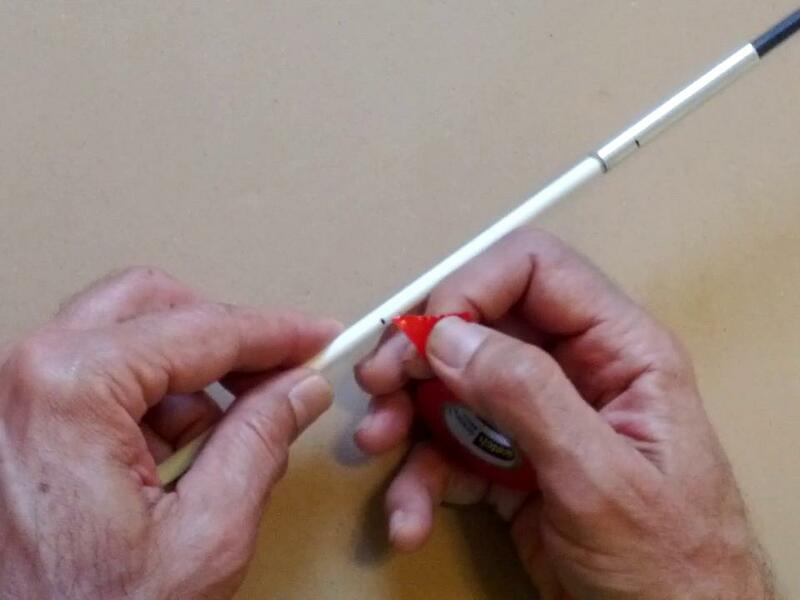 To make the two ends most visually distinct, put the tip color at the white end of the pole. 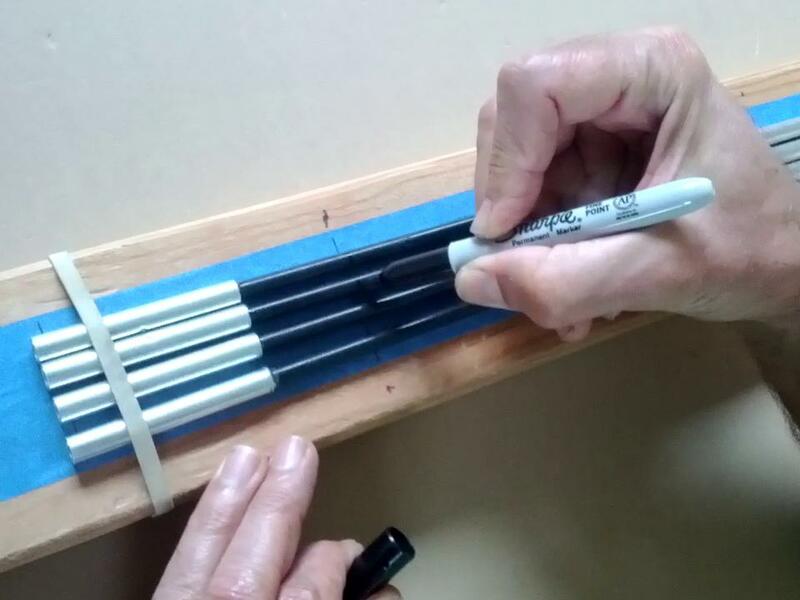 In all the banding, wrap the tape onto the pole tightly enough that it stretches. There are a few details that will increase field durability. At the end of the wrap, if you tear the tape at an angle, this end also will be more neat. The tape will then naturally break leaving an angled tear, ready to start the next wrap. 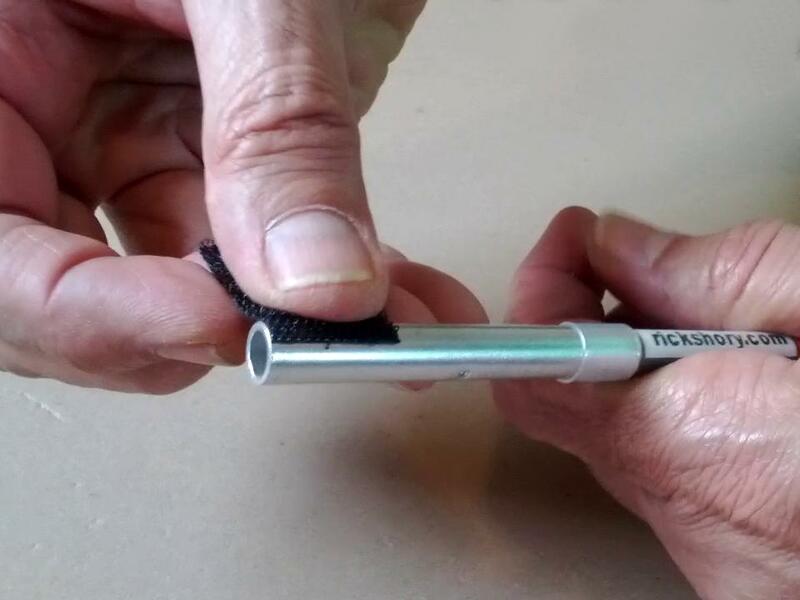 For pole junctions that will not need to pull apart, you can just continue the tape up or down from fiberglass pole sections to aluminum ferrule. However, at junctions that do need to pull apart, make two tape wraps, one on each side of the junction. 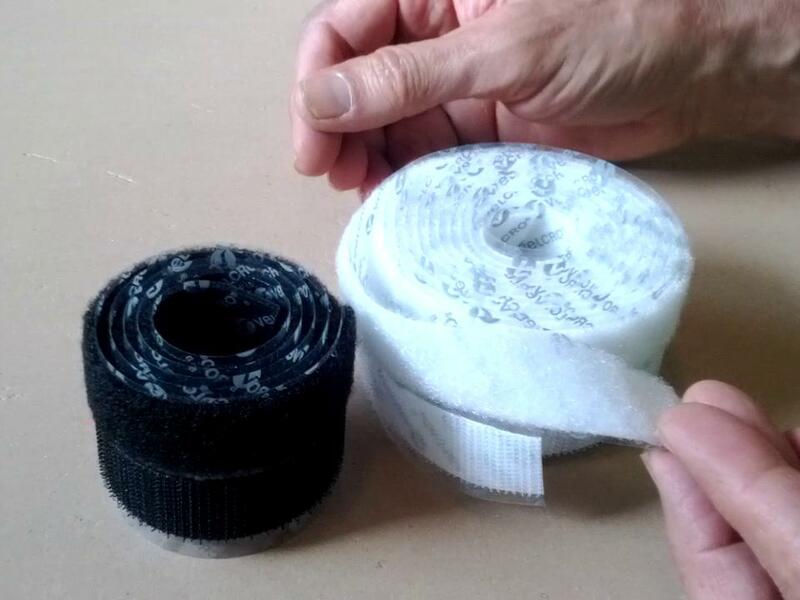 If you want to add a label, now is the time, before putting on the Velcro ends. In this example, I show my web domain. You may want to put a barcode for inventory, or some contact information so lost equipment can be returned if found. You want your label to still be readable, even after years out in the weather. Otherwise, it’s not worth taking the trouble. In field conditions, a label just stuck on would soon be damaged or gone from moisture, abrasion and dirt. A paper label would quickly degrade. 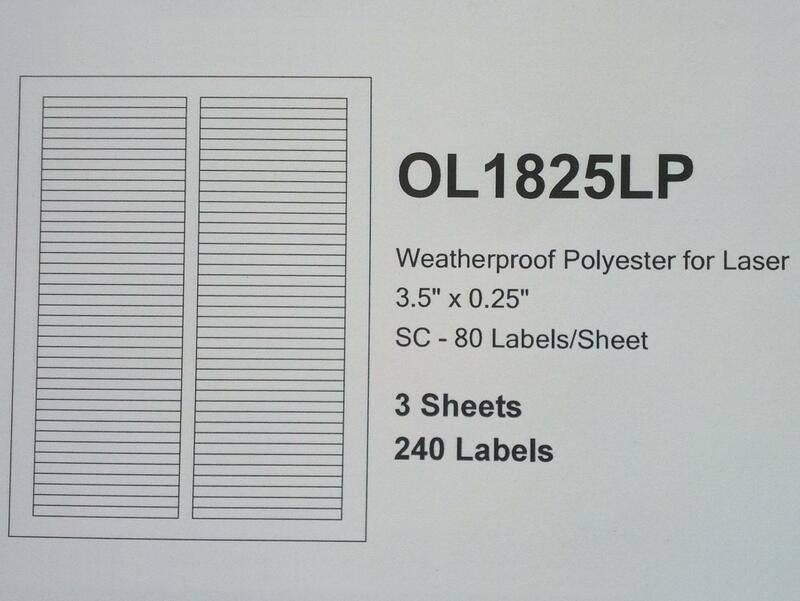 I use these weatherproof labels, item number OL1825LP, from onlinelabels.com. Note that these are very small labels. You do not have much room on a slim tent pole. Even these tough labels would break down or wear off if left exposed. 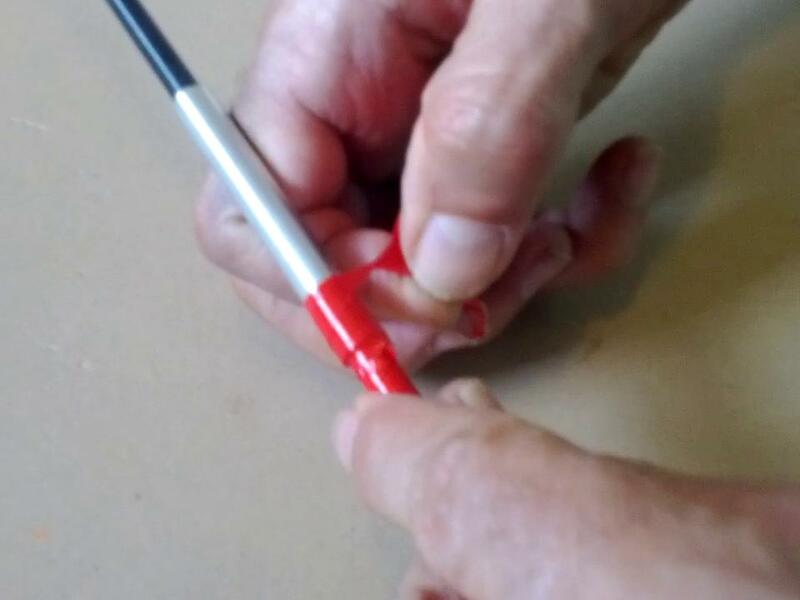 I cover the labels with transparent “heat shrink tubing”, often used in electronics to insulate wires. The size is 0.375″ (9.53mm) diameter. It is available from DigiKey, part number A038C-4-ND. It come in four-foot lengths, which you cut into short pieces to cover the labels. 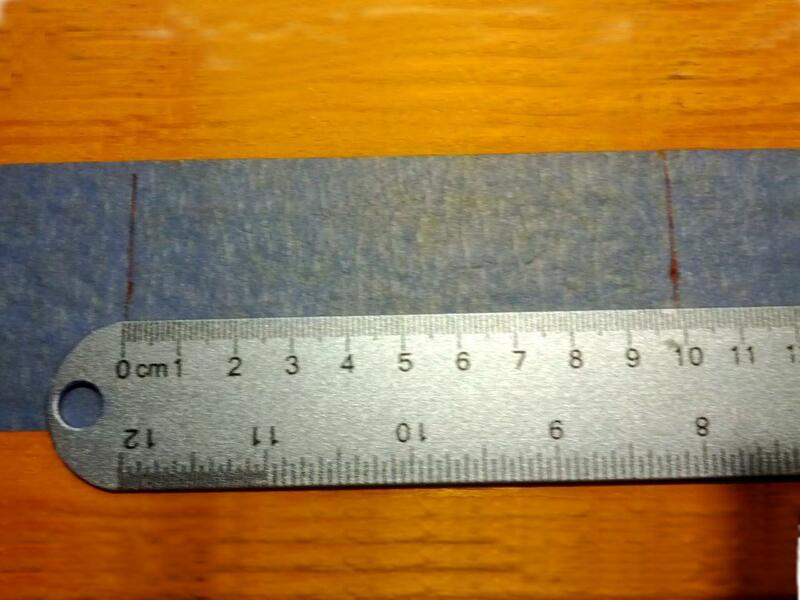 A piece about 2.4″ long is good for covering each label. You can cut 20 of these out of each four-foot length. 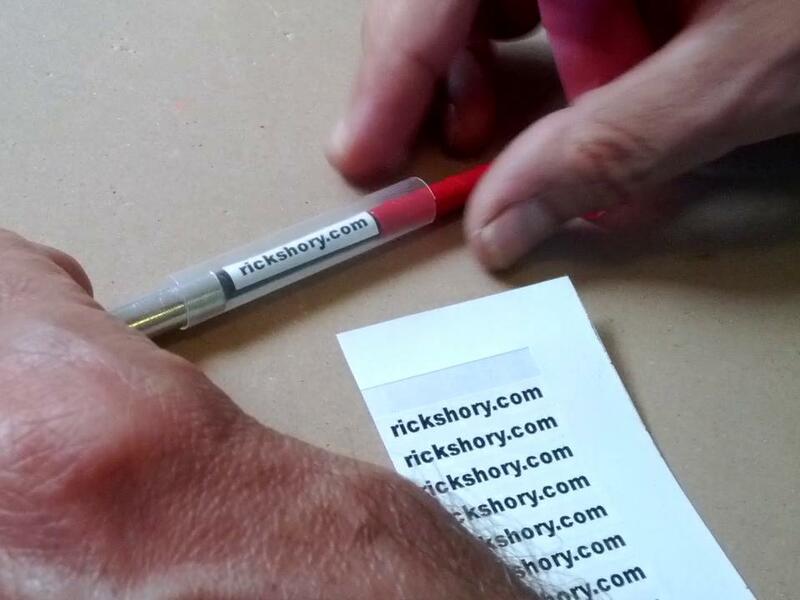 Apply a label and slide the shrink tubing over it. Heat the tubing to shrink it in place. 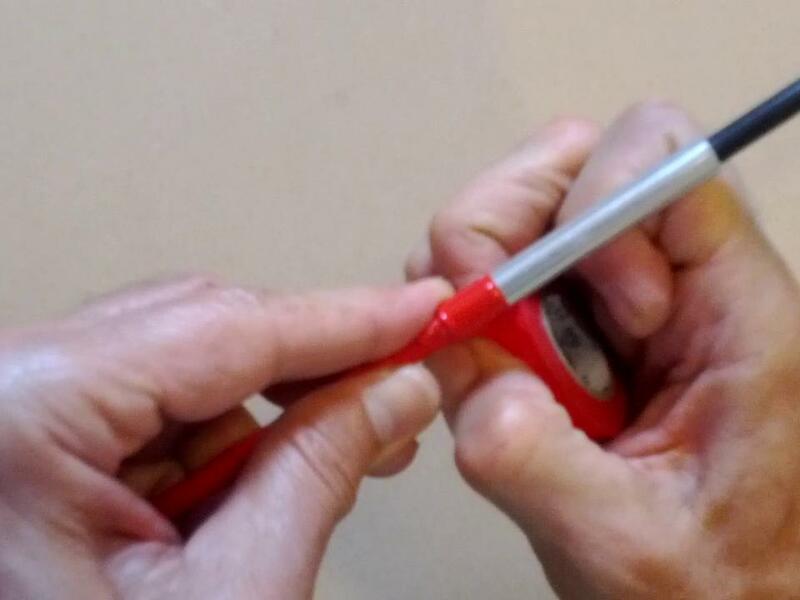 Using a candle, as shown here, you can “roll” the pole as you gradually feed it past the flame. 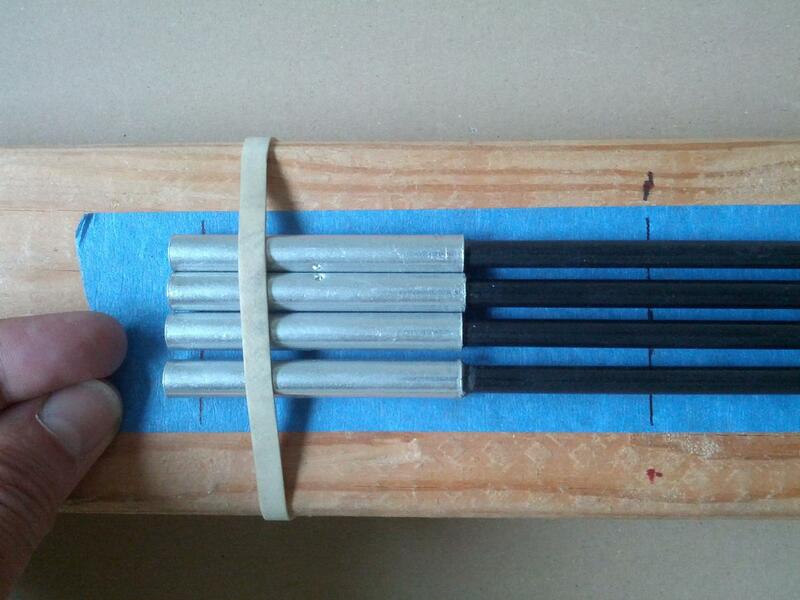 Start from the larger aluminum ferrule end to avoid trapping any air bubbles. 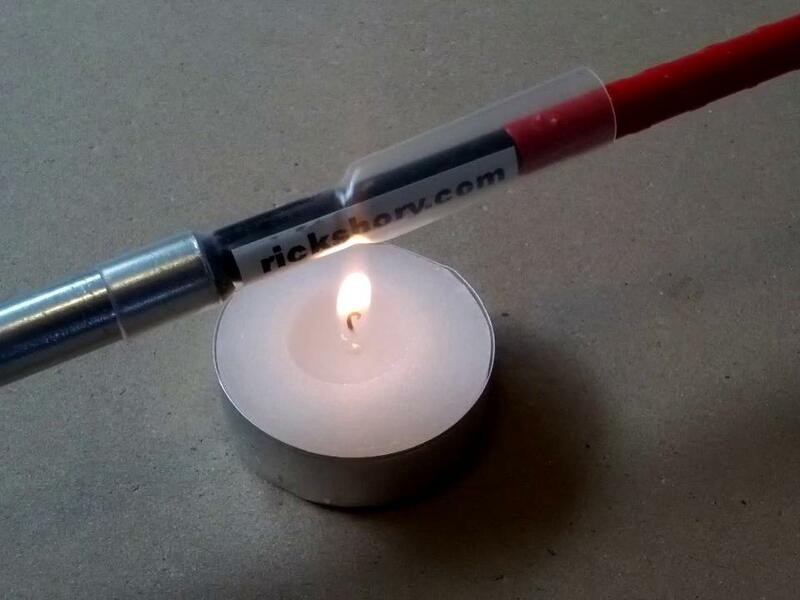 If you take care to keep the tubing above the tip of the flame, you will not have any black soot. I use two different colors of sticky-back Velcro, to accentuate visual contrast. The hook Velcro of one color goes on one end of each pole, and the pile Velcro of the other color goes on the other end. It does’t matter which goes on the “tip” end, as long as you are consistent for all four legs. That way, you know at a glace “opposite” ends will always stick together. 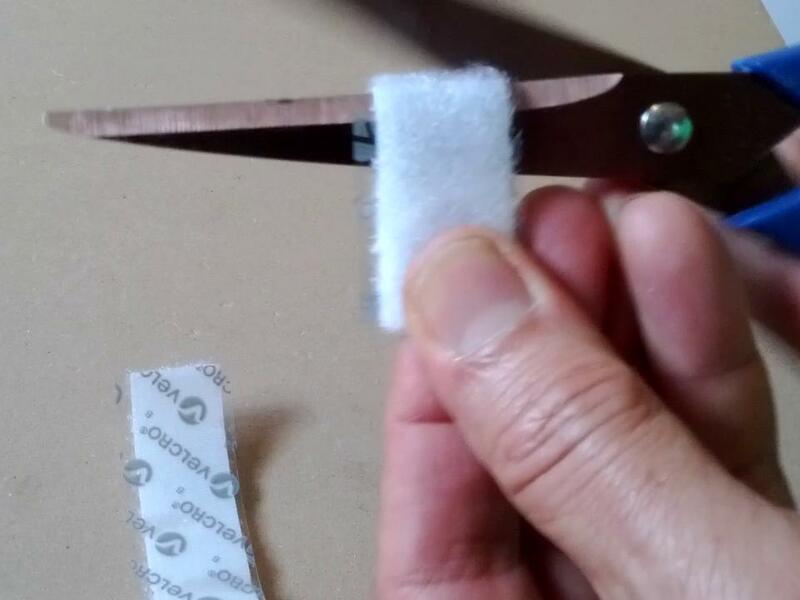 If you cut one length of Velcro 5.5 inches long, this will supply all four pieces you need for the legs. You can fold this and cut it in half, then cut each of those in half again. The Velcro backing is pretty sticky. However, in the dirt and wet of field work, it would come loose. 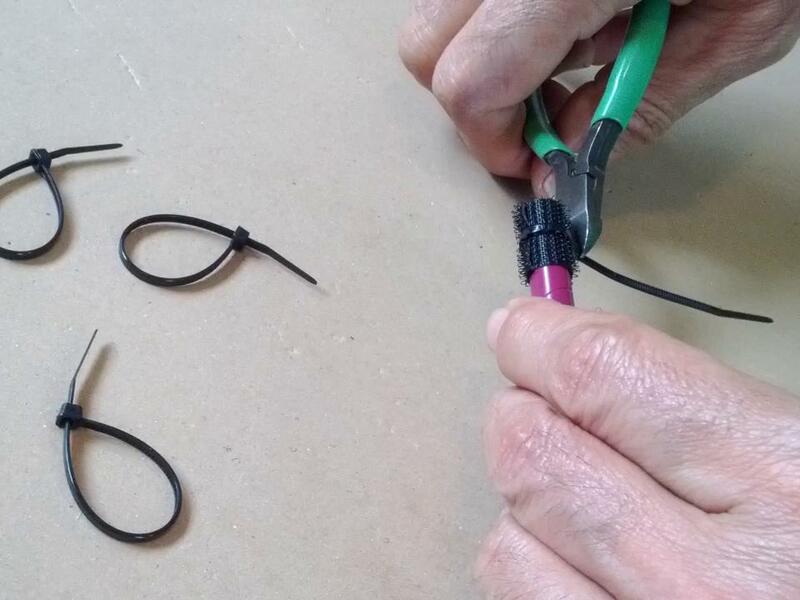 Hold it on with small 4-inch cable ties. It is convenient to prepare these by partially inserting the tail, to make small loops. Then, they will be ready to use when you stick on the Velcro. Wrap the Velcro sections around the ends of the poles. The Velcro will overlap slightly. Note that the exact point of one-meter length on the pole is about a centimeter in from the end. 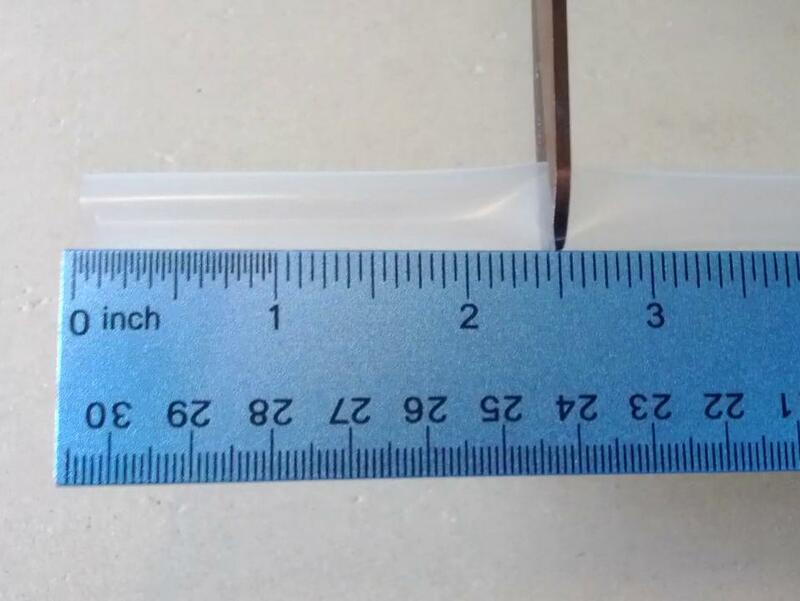 This lines up with the center of the width of the Velcro. 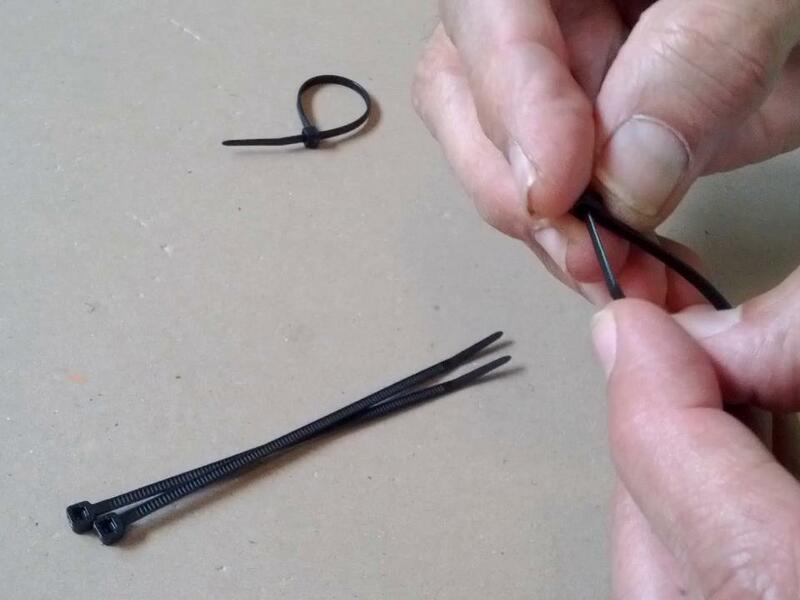 Slip on a cable tie, pull it tight, and cut off the tail. The finished set is convenient to be bundled up with a rubber band. 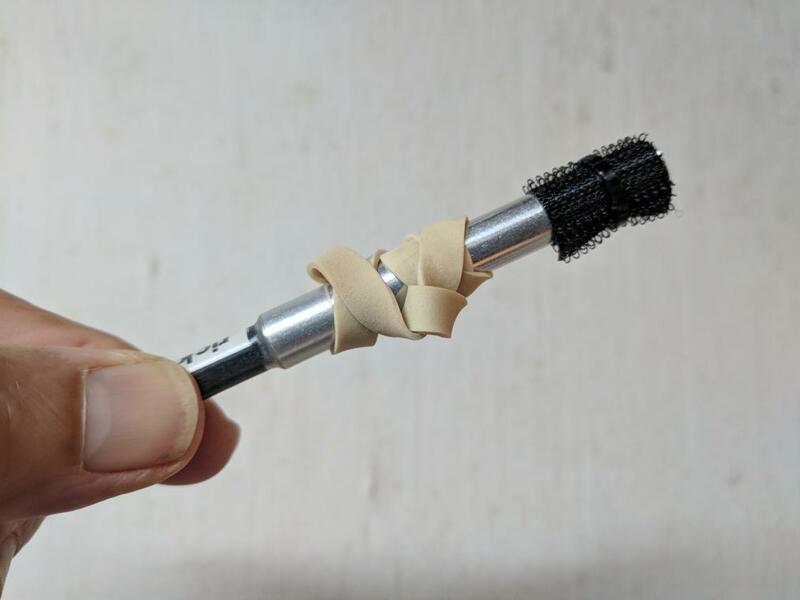 While you’re using the frame, you can put the rubber band around a leg end. There, it will be handy when you pack up. The entire set weighs only about 275 grams, less than 10 ounces. I developed this while working on federally funded research grants, so the design is in the public domain. You can build a set for about $35 in parts. People also request to buy the complete sets from me. I charge $192 per set, plus $21 shipping. Two or more sets get free shipping. 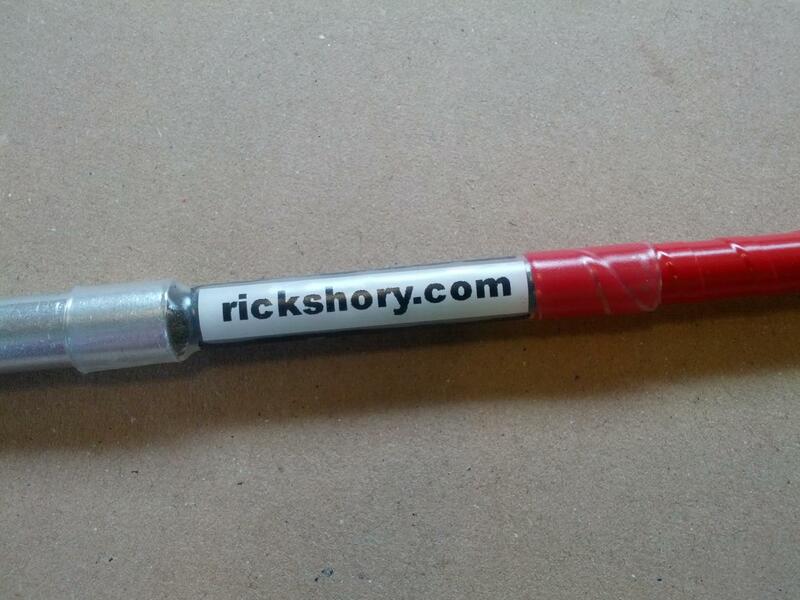 Ordering details are at rickshory.com. Categories: botany and horticulture, how-to, science | Tags: botany, environment, nature, outdoors, plants, technical | Permalink. Victoria, British Columbia, Canada, is arguably an attempted clone of jolly old England. How does it compare in latitude with, say, London? London (51.510939, -0.126423) is more than 200 miles (320 km) further north than Victoria (48.429074, -123.365744). Victoria is a little south of the latitude of Paris. So, what does England line up with in the contiguous United State? Nothing. The southernmost point of England, in the Isles of Scilly (49.863444, -6.400884), is about the same latitude as Campbell River, British Columbia (50.024343, -125.282589), or Garibaldi Provincial Park (49.914004, -122.751321). Further east, it lines up with Winnipeg, Manitoba (49.876143, -97.142472). This is more than 150 miles (240 km) north of even the odd jut the US border makes north at Lake of the Woods (49.384471, -95.153387). The northernmost point of England, on the border with Scotland (55.810209, -2.036247), is 80 miles (128 km) north of the southernmost point of the Alaska panhandle (54.662193, -132.684565), so this is the only overlap between England and the USA, far southeast Alaska. Unless you count the Aleutian Islands (southernmost point: 51.215139, -179.130465), which actually dip a little further south than the M25 ring road around London (51.258421, -0.083643). Which is further north? Medford, Oregon, far south in the state, near the California border? Or Medford, Massachusetts, in the vicinity of Boston, in chilly New England? The two towns are at practically the same latitude. The center of Medford, Oregon (42.339493, -122.860266) is only about 6 miles (10 km) south of the center of Medford, Massachusetts (42.424104, -71.107897), so close their outskirts would overlap. Which is further north? Portland, Oregon, with its mild, almost Mediterranean climate? Or Portland, Maine, on the icy rockbound shore? Portland, Oregon (45.524255, -122.650313), is about 125 miles (200 km) further north than Portland, Maine (43.659443, -70.267838), which lines up on the Oregon coast with mild, green, foggy Reedsport (43.703852, -124.103028). What does Maine line up with on the West Coast? Surely, feels like it must be Alaska! No, the furthest north point of Maine (47.459851, -69.224461), lines up with the Southcenter freeway interchange of I-5 and I-405 (47.462883, -122.265114), in the southern part of the greater Seattle metropolitan area. Why are west coasts so much milder than east coasts? This is oversimplified, but: Equatorial winds push warmed ocean water from the east, which sets the major ocean basins into great gyres, clockwise in the northern hemisphere, counterclockwise in the southern. Winds in the mid-latitudes are from the west, so as they pass over the warmed water brought poleward by the gyres, the air picks up heat and carries it to the first continent it meets. Since the winds at these latitudes are generally from the west, the warmed air will come on to western shores. There are complexities beyond that, but that’s basically it. Categories: science | Tags: Alaska, environment, nature, science, technical, travel | Permalink. Growing a few grape vines around your house is a different proposition than a commercial vineyard. Much of the information you will find is geared towards large-scale production. In this post, I am going to concentrate on backyard growing. There are significant differences in focus, both in propagation techniques, and in training the vines. You start a new grape vine from a “cutting”. A cutting is simply a section of grapevine. You get roots to grow from the bottom, and leaves to grow from the top, and then you have a new grape plant. Grapes will grow from seeds (except of course seedless grapes), but you’re not sure what you’re going to get. To propagate a certain variety, you want to use cuttings. In grape growing, you prune off a considerable amount of vine each winter. This naturally provides material for cuttings. 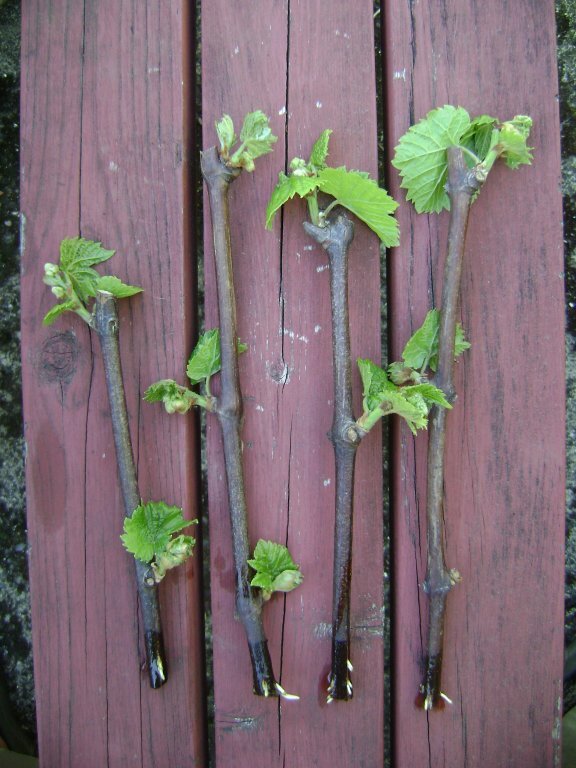 Most information about grape propagation is geared towards these winter cuttings, made from dormant, leafless vines. I’ll discuss these, but also alternatives. To start a sizeable vineyard, a grower would, of course, be dealing with a great number of cuttings. The easiest way to get these is to section up the prunings from existing vines. So a lot of grape propagation information concerns the mass organization, storage, and rooting of these winter cuttings. On a backyard scale, however, not all these points apply. To divide out a section of vine to make a cutting it takes, of course, two cuts. One is the lower cut, which will be the bottom of the cutting, where roots will grow. The other is the upper cut, the top of the cutting, from which the leaves will develop. In large scale propagation, it’s handy to be able to tell these ends apart at a glance, and so a tradition has come about: The lower cut is straight across the vine, just below a node. The upper cut is angled, just above another node. If you receive grape cuttings, they will usually be done this way. If you are dividing up grapevines to make your own, it’s a handy grammar. However, you don’t have to strictly follow this. 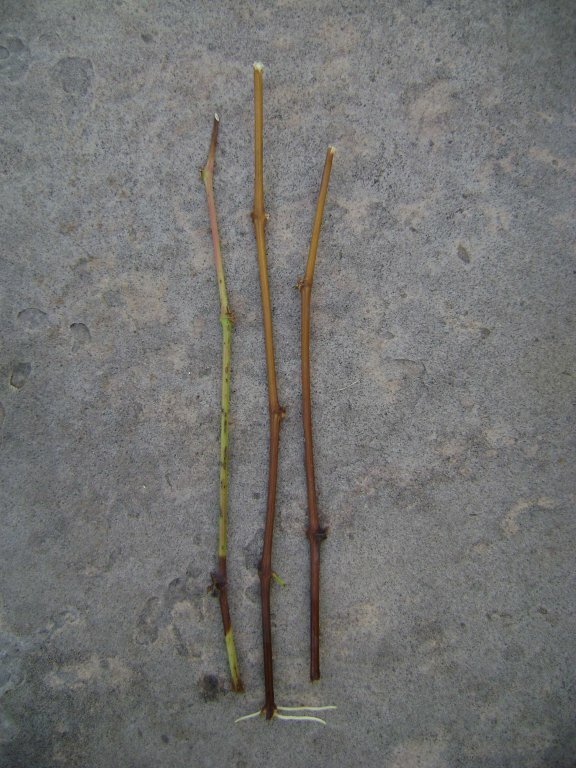 Grape cuttings: 3-node, 2-node, and 4-node. It’s fine to have more nodes, such as the four nodes of the cutting on the right. I have had one-node cuttings grow, by accident. 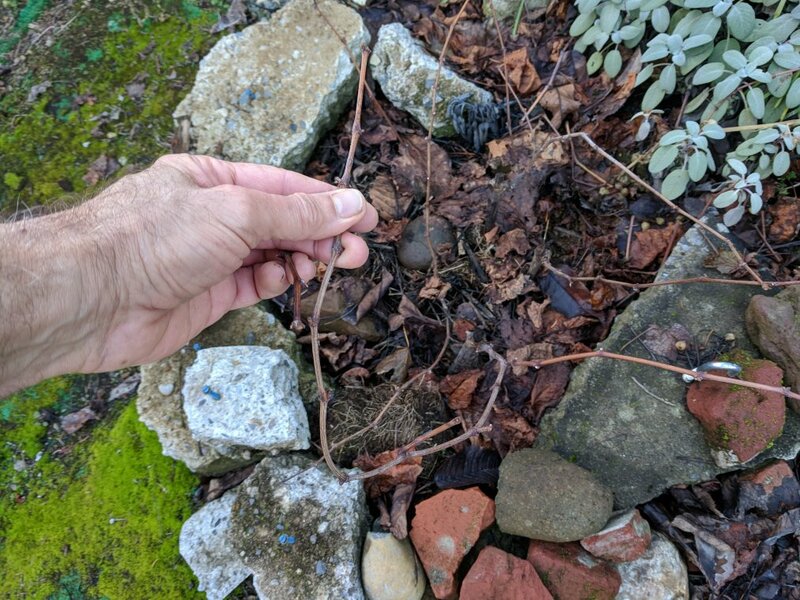 When I prune my grape vines in winter, I just chop up the small stuff with my pruners, and let it fall on the ground. Usually, a few pieces happen to land among the garden plants just right, and get watered just right, so that some time the following summer they start to grow. Roots come out below the node, and the node bud opens out into leaves. So, if one little section of grape twig is all you can get, you might be able to grow a vine from it. Commercial propagation consists of bundling up the grape cuttings for winter storage, and then getting them to grow in the spring. You may read about technique such as burying them in sawdust or sand, using rooting hormones, burying bundles upside down, and using bottom heat in a propagation bed. I’ll explain what these are about, and how they apply, or don’t, to home propagation. The basic issue of storage is to keep the cuttings alive, and keep them from sprouting too soon. The main reason cuttings would die is from drying out, thus the burying in damp sawdust or sand. This is reasonable for large bundles, but there is no reason for you to go get these materials for only a few cuttings. You can just keep your cuttings in vegetable bags, like any other produce. As I’ll describe later, you can start your cuttings growing in the winter. But then you are faced with the problem of keeping the plants healthy until spring when they can go outdoors. So, unless you particularly want to do this, you should keep cuttings cold, so they stay dormant. If you have only a few cuttings, you can keep them in your refrigerator. For more, you can store them outside. Freezing is not particularly a problem for grape cuttings. Any variety you are planning to grow, which is hardy in your climate, can stand up to your winter temperatures. However, in continental climates, winter weather is often very dry. Therefore, grape cuttings left out on the open ground can dry out. 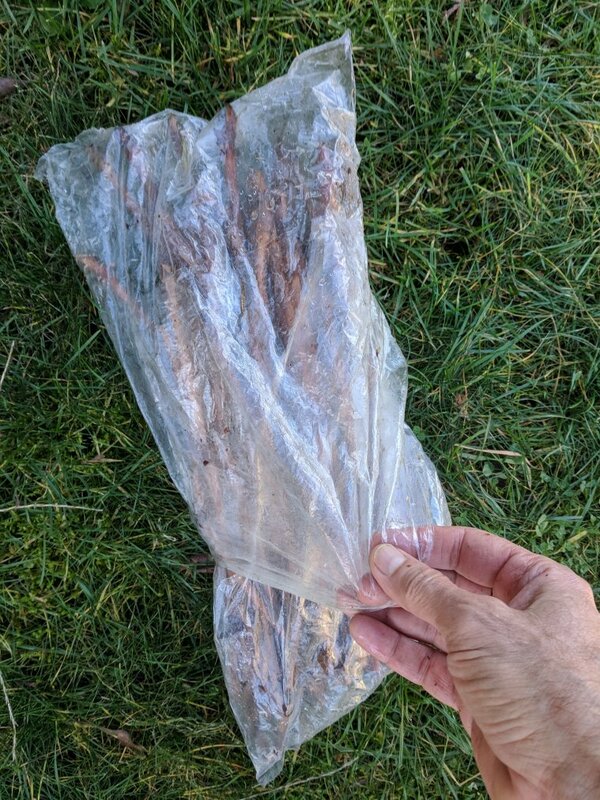 A convenient way to both avoid this, and keep the cuttings organized, is to slip them into plastic vegetable bags, and tuck these under a few inches of dead leaves or other mulch. In a mild, wet-winter climate like the Pacific coast, you don’t even need to bury them. Grape cuttings may be too long for a single bag. You can use two bags, one “telescoped” inside the other. Bags for long cuttings, one overlapping the other. 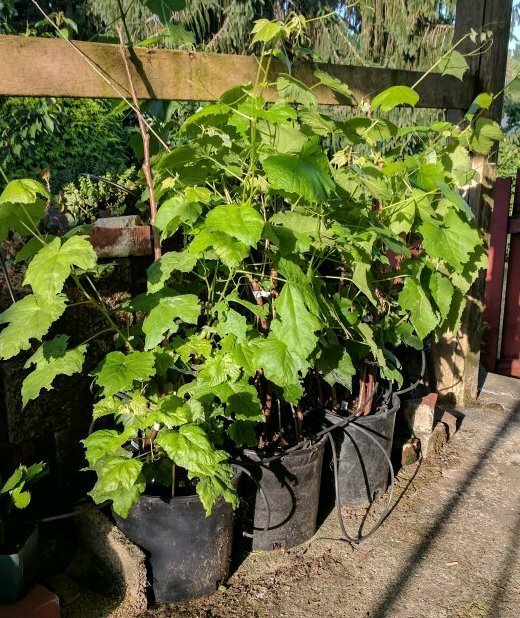 If you have plenty of cuttings available, the easiest way to start a grapevine is simply to plant a number of cuttings close together where you want your vine. Here, I put eight cuttings close together. This was in early March, but you can do it any time in winter the ground is not frozen. I did not use any rooting hormone, or other treatment. The ground was so stony, I could not plant all of them as deep as ideal, which would have been with only the tip above ground. Still, six of the eight cuttings grew. This picture is from the following December. The point of this technique is that, even though some of the cuttings die, you still get a grapevine going. Just pull out the dead ones and the extras, and leave the strongest. If you have lots of cuttings, which you will if you have an existing grapevine, or know someone who does, this is by far the easiest way to start a new one. Incidentally, there does not seem to be any pattern to which cuttings take hold. In this case, the two that died, out of the eight originally planted, looked just as strong and promising as the ones that grew. This multi-cutting method does not, of course, make sense for a large-scale planting. For that, you want to be pretty sure each cutting will grow, so you can line them out in rows and end up with a vineyard. From cuttings just stuck in the ground, I have always had more than 50% grow, typically 75%. But that’s nowhere near good enough for commercial production. Filling in 25% gaps would be a lot of effort. It would be almost as much work to take out the extras, from mutliple cutting planted at each spot. 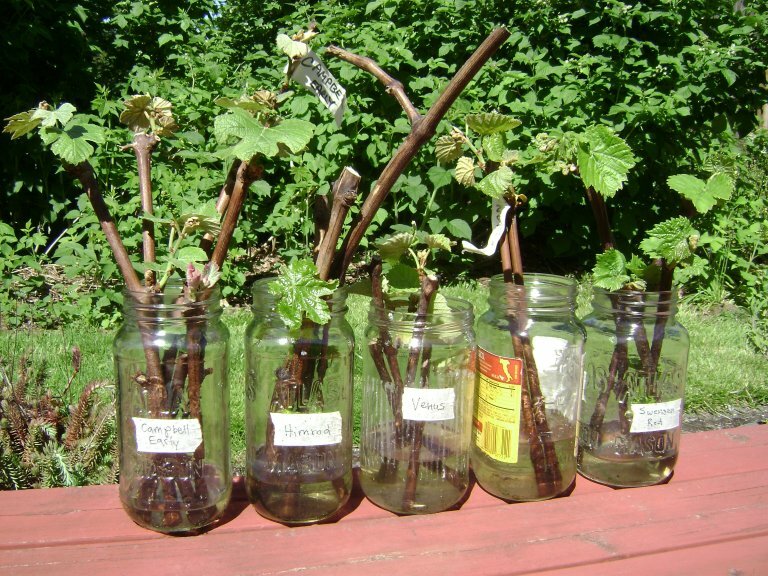 The propagation techniques you come across in the grape literature are all about increasing the odds per cutting, so you get one grape vine from each thing you plant. For home-propagating a few vines, these techniques may not apply. If you have lots of cuttings, you can get away with a low per-cutting success rate. But what if you have got ahold of only one precious cutting, which you absolutely must make grow? Maybe you had to pay a lot for it, or it was all the source could spare. Maybe it came from halfway around the world, and you will never be able to get another. I stumbled on a simple, inexpensive technique that, for me, has given 100% success: Root them in water. Nowhere in all the propagation literature had I ever heard of rooting grape cuttings in water, but it works quite well. It allows you to carefully monitor progress, as well as being interesting to watch. It would be far too much fuss for mass production, but it’s ideal for a few. Just put your cuttings in jars that have some water. Change the water if it gets too murky. Because there is plenty of water, the cuttings cannot dry out and die, unless you let the water dry up. You can put the jars outdoors, in direct sun, so any leaf growth is firm and strong. Cuttings that have been in water, growing roots. If you look close at the picture above, you will see that the source of the cuttings did not much follow the “grammar” of number-of-nodes, and straight- and angle-cuts. But the cuttings are rooting just fine. The conventional wisdom is that grape cuttings grow roots from the nodes. However, as you can see, the roots are coming from the bottom of the cuttings, ignoring the nodes. Cuttings do have a tendency to put out more roots near nodes, but this is by no means strict. Cuttings with roots at this length are ready for planting. Short roots like this are called the “rice” stage; little white rods like grains of rice. 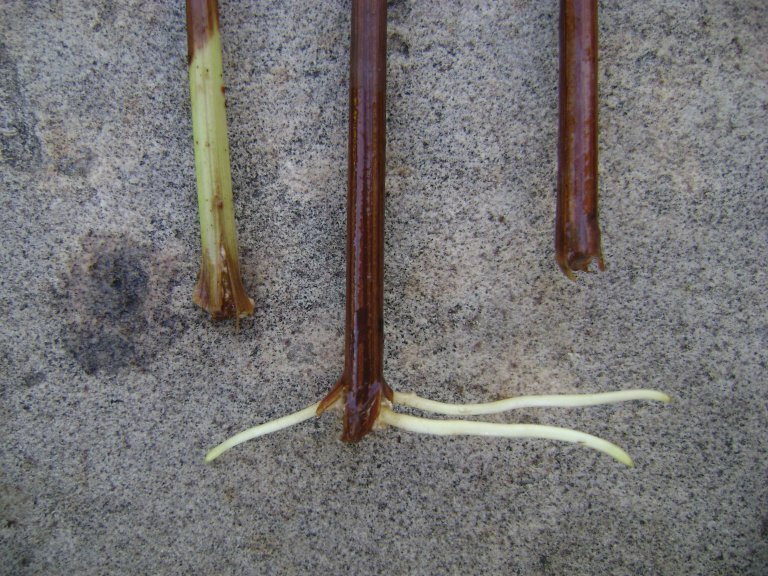 Roots let to grow to the “spaghetti” stage are more prone to break off. Longer roots don’t give much advantage in water absorption. They have to develop a new set of root hairs, from additional growth, before they can supply much to the plant. Virtually always, cuttings in water will have leafed out by the time they root. This is the main thing you will have to fuss over. Roots absorb water, and leaves expend it. A typical scenario is this: Grape cuttings are planted out during cool, wet weather. They look fine, the foliage fresh as lettuce, as long as the rains remain. Then, one day, the weather turns hot and sunny. The roots can’t keep up, and the leaves shrivel. In the extreme, the whole thing may die. It can also happen that the leaves shrivel up, but the cutting hangs on till it finally makes enough root growth to put out new leaves. Although a cutting like this may survive, it will be set back, and not make nearly as much growth in its first year as a cutting without this hardship. What to do? Simply shade a newly planted cutting until it adapts. You can rig up special shaders in various way, but often the simplest thing is to just put a lawn chair on the sunward side of a new grape cutting. This would be on the south side in the northern hemisphere, on the north side in the southern hemisphere. A cutting can handle as much indirect sky light as there is, and it won’t have much trouble with morning and evening sunshine. It’s direct mid-day sun will that will dry it out. You only have to shade a new cutting for a few days, or a few weeks at most. Soon the roots extend and send more water up to the top. The leaves grow and send food down to the roots. And the plant is in business. Up till now, we have been talking about cuttings from winter-dormant vines. I found by accident that you can root green leafy summer shoots. Once, I had a chance to get grape cuttings of a variety I wanted to try, but it was midsummer, not the usual time. I kept the cuttings in water, intending to study them. After some weeks, I noticed they were growing roots. Summer cuttings may drop their leaves by the time they grow roots. This can take quite a while. In this case it was September, and by then the shoots had dropped their leaves. But I had a rooted cutting I could plant. Later, I saw summer grape cuttings being propagated in a university research greenhouse. These were two-bud cuttings, and half of each leaf had been removed to reduce water loss. The cuttings were under an “intermittent mist” system, which is a method that works very well, but it rather complex to set up. So, if there is a variety of grape you want to try, and the only time you can get cuttings is when they are fully leafed out in summer, you can get fairly good success by rooting them in water. For various reasons, you may need to transplant a grape vine. If at all possible, do this while the plant is dormant and leafless. Leaves lose a lot of moisture. In my experience, you can transplant a grape vine of any size, but a mature plant will be set back for about a year. It will take hold, as though it were a large, rooted cutting, but it will put out less growth the first year after transplanting, and produce fewer grapes. A large grape vine can be quite physical to wrangle, so take this into account in deciding whether you want to move a vine, or simply start a new one. You can have grape vines in full production, from cuttings, in three years. 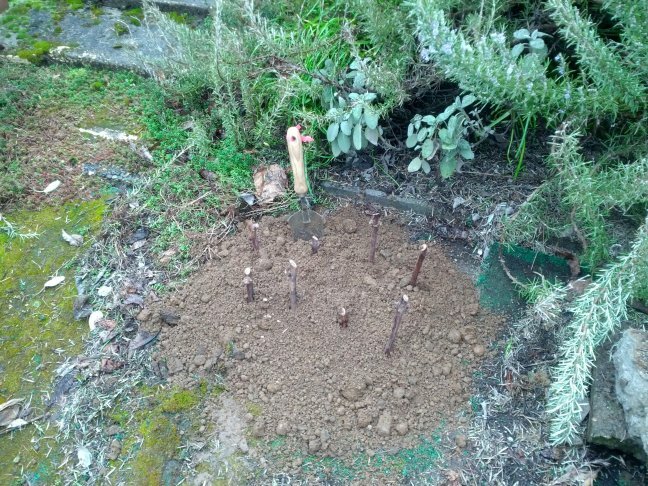 Below is a picture of a one-year-old grape plant, dug up for transplanting. This grew from a cutting merely stuck in the ground, with no other help than regular watering. It is typical for a vine to make only a few to several feet of top growth the first year. It’s developing lots of roots, getting ready to take off following year. Now, there is more root than top. Grape dug up for transplanting. 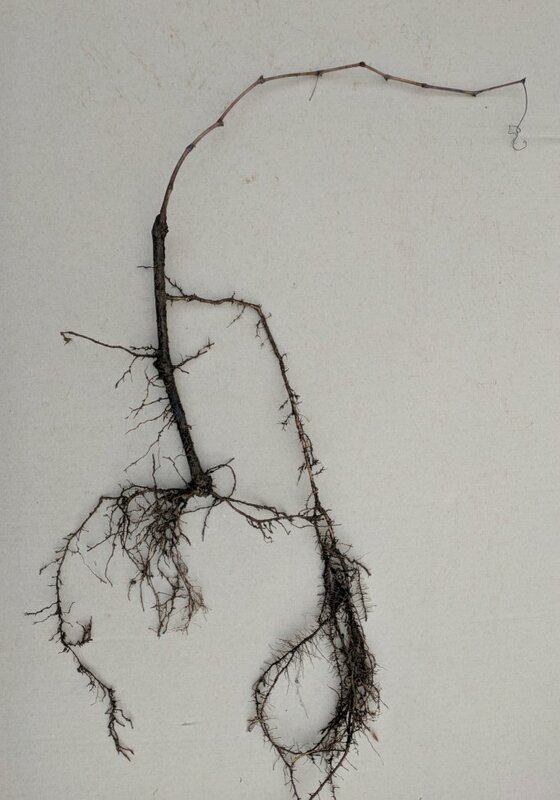 Grapevines typically have a root system that consists primarily of relatively few long, snakey roots, rather than much of a root ball. Notice the plant in the picture: Even though more roots started from near nodes, the strongest root came from between nodes. This is just the way it happens sometimes. Grapes are mostly woodland plants, where their roots have to compete with trees. Their roots grow long, to seek out what they need. For the backyard grower, this means that after a few years, you are going to be finding your grapes’ roots many yards away, mining water and nutrients from whatever garden beds they can get into. Be aware of this when choosing a planting site. Grapes do fairly well with their roots under a lawn, but be aware of what this can mean. For some years, when I lived in a dry climate in Colorado, I grew grapes on the chain link fence that bordered my neighbors. The neighbors were much more lawn conscious than me, so the grapes put most of their roots over there, where they could get more moisture. Then, at one point the neighbors were going to sell their house, so in order to spruce up the lawn, they sprayed weed killer. The grapes took it up, and nearly died! You can of course grow grapes in pots, but they are not naturally adapted to this. This picture is of some grape vines, in their first summer, developing from rooted cuttings. It is only July, and the plants are already getting to unmanageable size. If they were in the ground, the roots would have extended at least as long as the vine top growth. But here, the roots are having to spiral around and around inside the pots. These plants are sustained by drip irritation, and their water demand is only going to increase. If the moisture were ever interrupted, the plants would be severely stressed. Of course nurseries only sell grapes as potted plants. Typically, these vines are fairly small. If they had been let to grow large in pots, they would be significantly potbound. They are going to have to stretch out their roots some time. If possible, let them do it from the start. Now, I would like to demystify some of the grape propagation information you are likely to come across. Often, terms are given without any definition, and techniques are stated without any reason why. 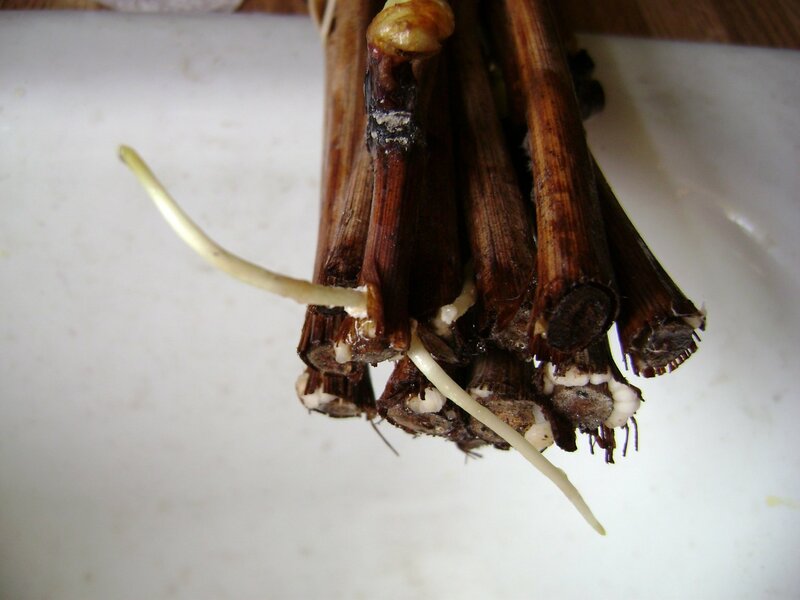 You may come across the term “callus” in grape propagation. Callus is whitish cauliflower-like growth that plants may form in the process of re-organizing their tissues. Some varieties of grape develop a considerable amount of callus, which serves as a signal that roots are on the way. However, others grape varieties make no visible callus before roots pop out. The propagation literature may recommend a certain operation to “callus” cuttings; that is to nudge them towards creating roots. This is what “callus” means, used as a verb. Keep in mind there may or may not be any visible change. The main reason grape cuttings fail and die is that leaf growth outstrips the moisture roots can supply. Most of the details of large-scale grape propagation are to get around this problem, so a higher percentage of the cuttings succeed, and a vineyard planting will requires less fill-in afterwards. Again, this is less important for a home grower, but it’s the reason behind the recommended methods. A bud is ready-made. All it needs to do is open and put out leaves. However, for a grape cutting to grow roots, it has to re-organize its tissues to create these. Different varieties of grapes vary in the time-lag it takes them to do this. In the extreme, you can get a leafed-out cutting that still has no roots at all. To improve on that, you want to speed up the formation of roots, relative to top growth. Rooting hormones act as “auxins”, which are a type of naturally occurring plant hormone. Plants produces auxins in their growing shoot tips, and the auxins are transported downward through the stem. If the stem is cut off, the downward travelling auxin accumulates at the cut end and stimulates the tissues to re-organize into roots. There’s more to it, but that’s the general mechanism. 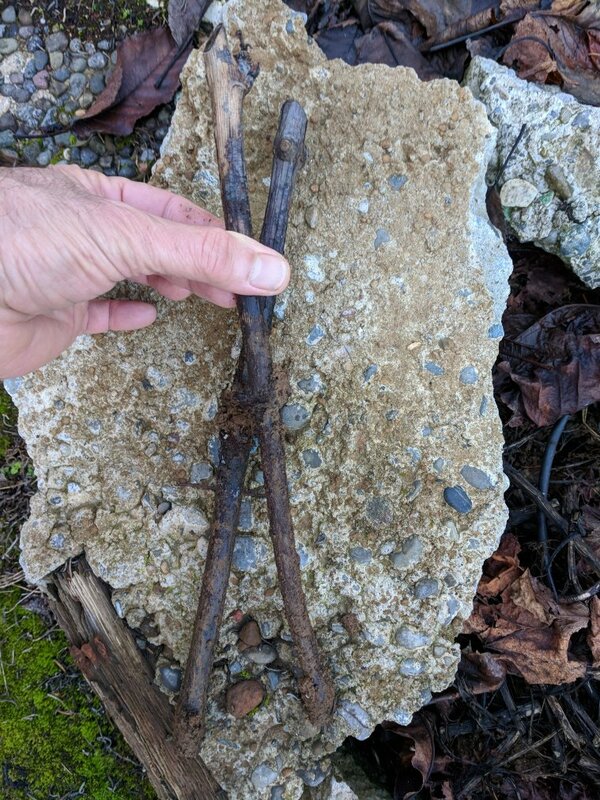 This explains why reluctantly-rooting grape cuttings will finally get around to growing some roots when the buds open. The growing shoot tips produce more auxin. This is how the water method works. It provides life support until roots grow, no matter how long it takes. Rooting hormone is simply externally supplied auxin. Much like natural auxin, it moves downward through the stem and accumulates at the lower cut end. The usual mode of application is by dipping the rootward end of a cutting into a powder or a solution, so the hormone starts near to where it’s needed. Then the cutting is planted in a soil-like medium. It’s an open question whether rooting hormone would help cuttings root in water. Would the auxin accumulate in the water and help? Or would the water dilute it, and lessen its effect? From the product standpoint, this is usage beyond its specifications. 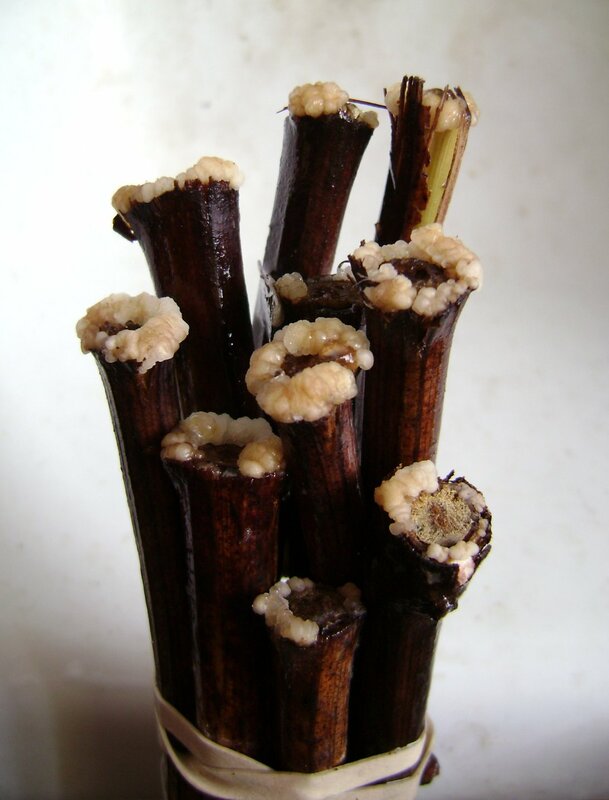 From the plant standpoint, grape cuttings root fine in water without it. Another aid to rooting is “bottom heat”. All else being equal, plant life processes go faster at warmer temperature. If we were to keep the bottom of the cutting, where we want roots, warmer than the top, the lower end should grow roots while the top is still dormant. This is, in fact, exactly what happens. Bottom heat is much used in commercial propagation. However, when you start looking into it, you will find it amounts to considerable outlay in effort, equipment, and expense. You will have to decide if the investment is worth it for a few grape cuttings. The idea of burying bundles of grape cuttings upside down for some period of time is to use nature as bottom heat. Since soil warms in the spring from the top down, this will make the root ends of the cuttings warmer than the tops. This technique could tip the balance in large-scale commercial production, if the weather and climate cooperate. However, think for a moment what’s involved in digging holes big enough to bury long bundles of grape cuttings. Not to mention, digging them all up later, to plant right-side-up. There is no reason to do this, to start a few new plants. I have tried various things with water, to get roots while buds were still dormant. One time, I used winter-dormant cutting in late fall. I put them in water, in an indoor growth chamber about 70 degrees F. I knew that most deciduous plants have a “chill requirement” and the buds won’t open until a certain time period of cold weather has elapsed. I figured I could get roots, with the buds still closed. Well, the plants had their own idea. The cuttings rooted well, but the buds opened too. By January, I had healthy, actively growing grape plants. Again, unless you particularly want these decorations, you should keep your cuttings cold, and dormant, till spring. I tried the bottom-heat idea, with water. My system involved an aquarium heater, in the refrigerator. The bottom ends of the cuttings were held at about 78 degrees F, while the tops remained about 40F. This worked, to some extent, but it was a huge amount of trouble. Continued in part two, grape vine training. Categories: botany and horticulture, how-to, long posts, science | Tags: botany, gardening, how-to, technical | Permalink. From the early 20teens, till now, I have been working on a project I call “Greenlogger”. It started from work I did with Dr. Heidi Steltzer at Colorado State University. She had the idea to log “greenness”, over the growing season, from a natural ecosystem such as a patch of prairie or tundra. This is important in climate research. 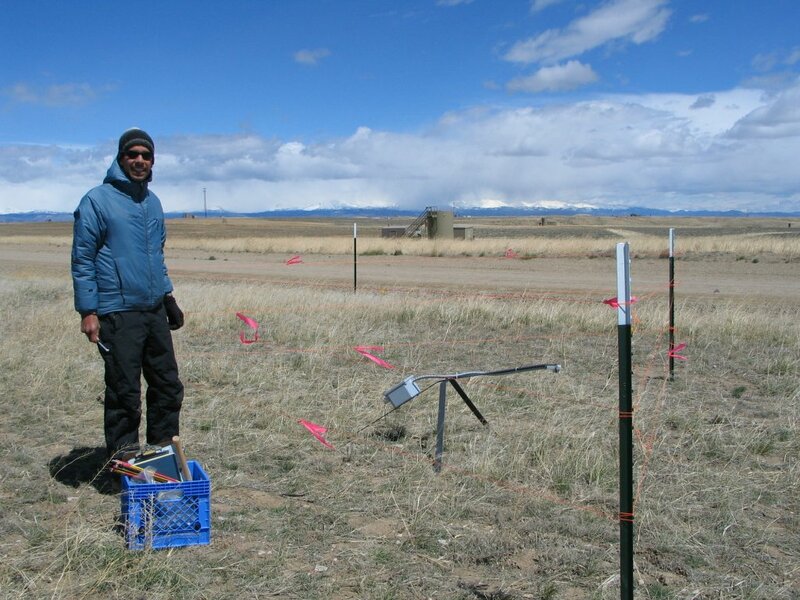 If you set up a number of such monitors, you can do experiments to simulate climate change. For example, in dry prairie, you can artificially water some sites and exclude rainfall from others. In tundra, you can melt the snow away early from some areas, using black ground cloth. You can hold the summer temperature a few degrees warmer by placing small tentlike structures. Also, long term records across many years will be able to show actual climate change. You monitor “greenness” spectrally, that is by looking at what light is reflected from plants and whatever else is covering the ground. You want this to be automatic, that is by electronic instrumentation. 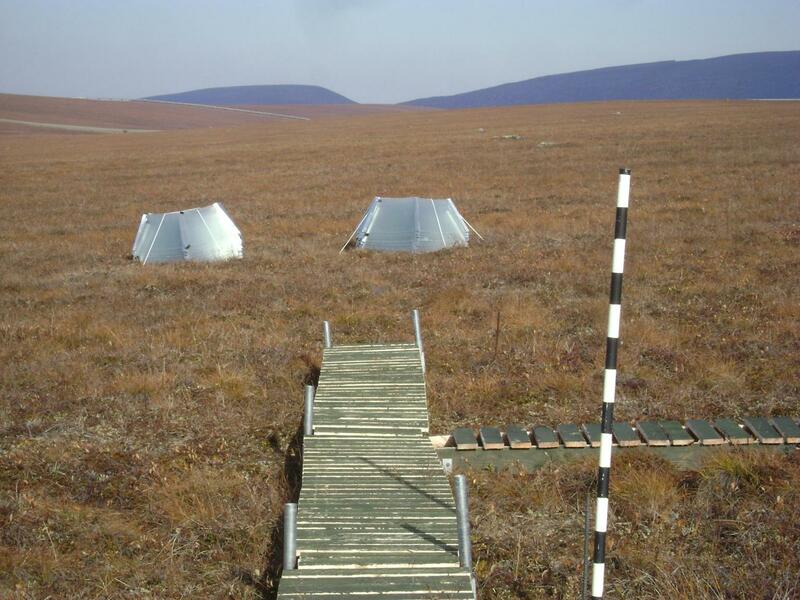 For climate change research, you want remote undisturbed sites, typically miles out on the high plains, in alpine meadows, or north of the Arctic circle. Visiting such places is expensive. You can’t afford to pay for people to go there, day after day, for manual observation. The other advantage of instruments is that they have no bias or opinion, and they don’t get bored. Spectral data is available from satellites, but only to a certain resolution, typically with pixels 30 meters on a side. If your experimental sites are only the size of a card table, the satellites will see nothing. Some day drones may be feasible, but they presently lack the reliability and repeatability, not to mention the flying range. There are various legal and jurisdiction issues with drones too. So, Dr. Steltzer had got her research proposal funded to use individual ground-based monitors, one at each site. I came onboard to make this happen. I inherited a good part of the design. You might think the spectral way to monitor greenness would be to take pictures, and analyze them for the color green. This is fraught with all sorts of complications, such as dark shadows in the frame, changing light conditions, and the fact that plants are such different colors green. To keep consistent with decades of scientific work, such as from satellite imagery, the greenness factor we used was “Normalized Difference Vegetation Index”, abbreviated “NDVI”. Here’s an oversimplified version, but it will explain the equipment design. Plants absorb visible light to use for photosynthesis, but they reflect infrared because it is no use to them. So, basically, the higher the infrared reflectance relative to visible, the more “greenness” down there. At large scale, you can make greenness maps of whole continents from satellite imagery. At small scale, there are instruments to clip onto individual leaves. We were working at an intermediate scale, looking at reflectance from a living ecosystem, such as meadow or tundra, in chunks about one meter size. The design for the monitoring devices had developed from two directions. One, obviously, was to detect the infrared and visible spectral bands. The other was weatherproofing. Satellites are far above the atmosphere, and you can take the clip-on devices home. However, ground based instruments that will run unattended must handle all the vicissitudes the environment can throw at them. The evident choice, at least for off-the-shelf, was weather station parts. To make all this happen, I had to use quite a bit of patching and overdesign. Some of the spectral detectors were photodiodes. These had amplifier circuits. Which needed batteries. Which required cases for those batteries. The batteries had to be kind of big, to assure they would run the whole time. And so the cases were big. And needed supports. Kind of big supports. By the time I came along, the design had solidified into the “mantis”. Can you see the resemblance? The frame of steel bars looks rather like a giant insect. The head is looking out, pensive and intent. The body is slung behind. It wasn’t long before the mantis began to evolve. I had to adapt it for a project in Alaska. There would be more extensive data collection, so there would be additional sensors. These would require a more complex weather station box. That meant “bigger”. Each mantis would have its own solar panel. Even as a mock-up, the insect is metamorphosing, sprouting new appendages. The sensor cables had to be protected from gnawing varmints out on the tundra, so they all were sheathed in metal conduit. The Alaska design looked less like an insect than an octopus. As in all science, you need lots of “replicates”. You can’t just have one experiment and one control, because any two sites will naturally be different. For the Alaska project we needed about two dozen of these mantises. I had to finalize the design, and scale up for the total number of parts. I cleaned out three local Home Depot stores, to procure some parts! I had to figure things out, down to the last nut and bolt, and get it all shipped to Alaska. There would be no neighborhood hardware stores out on the North Slope tundra. Things went well. At the research station, we spent some days in the lab trailers assembling all the mantises. When they were ready, we took them out to the tundra and got them going. In all, I worked on this project for three years, setting up the mantises each spring, and bringing them in at the end of summer. Each one weighed thirty-five pounds. Each one had to be taken a quarter mile out via a boardwalk, so as to keep the tundra pristine. Sometimes people helped me with them. Sometimes, in the spring, we could use snowmobiles. But still, there was a lot of lugging. I couldn’t help thinking about what all the thirty-five pounds was doing. I knew the design. The heavy steel frames were to support the boxes, which were to anchor the sheathing, which was to protect the cables, which were to reach the sensors. But the active guts down in the sensors was — tiny. At the other end, the frame needed extra iron to support a sizable solar panel, and a big battery, to power the weather station, which had to run all the time because it was general purpose. But the actual data chip down in the recorder was — tiny. What if I could put a tiny sensor right with a tiny data chip? Suddenly, all the boxes, sheathing and cables disappear. The spectral readings are only in the daytime, none at night. So that’s the only time you need solar power. Could the instrument “sleep” at night, and get by with a tiny solar panel, and a tiny battery, just enough to wake it up each morning? A good bit of the mantis design was how to get the data out. 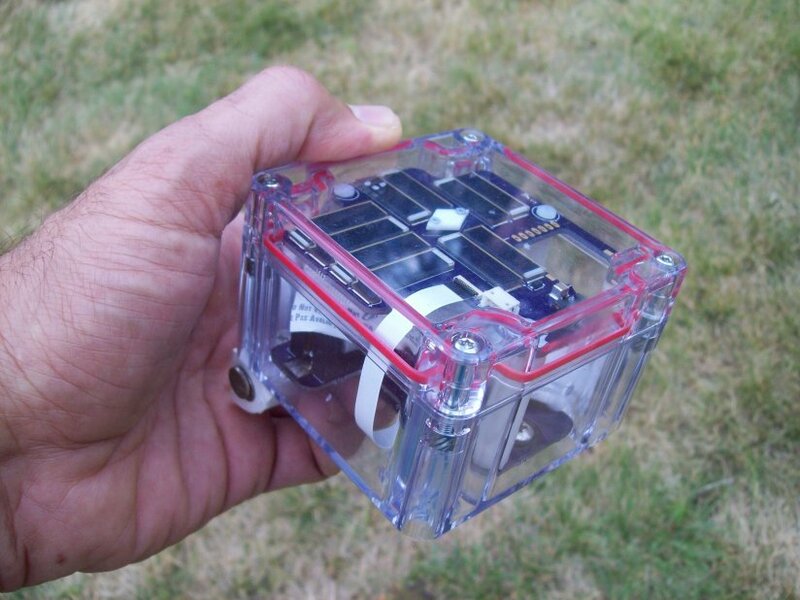 A weather station case needs robust hinges and a latch, to stay weatherproof. You open it, and plug in a cable. The other end goes to your laptop, which you have to lug out to the site. You have to make sure your laptop stays charged, and try to keep it from getting rained on too much. You have to be sure to bring the right connector cable! Also, while you have the weather station case open, it can catch rain, hail, and snow. So you put in desiccant packs to dry it out. And indicator cards to monitor that the desiccant is still working. And more desiccant packs when the first ones quit. What if you never had to open the instrument case? What if the system transmitted it’s data wirelessly, such as by Bluetooth? No need to bring a USB cable, or worry if you brought the one with the right style end. What if, instead of a laptop, you could pull the data in on your smartphone, which you could just keep tucked inside your jacket pocket? I started working on this. I had not done much electronics since grad school, so I had to get back up to speed. I could not use the popular Maker platforms, like Arduino and Raspberry Pi, because they need too much power. My thing had to run on the trickle of energy available from a few solar cells. I could not depend on a wall plug nearby. So, I had to get down to the raw microcontroller level. A microcontroller is like a one-chip computer. (The word is abbreviated “uC”, as the lowercase “u” is easier to type than the Greek letter “mu” (“µ”), for “micro”.) Many uCs have low-power “sleep” modes, but you need to program them on a chip level for this. I found that uCs had advanced quite a lot since I’d used them in my Masters project. Overall, much easier to program. Interfaces had been standardized, so it took fewer pins to connect to other chips. I knew I needed at least light sensors, and a micro-SD card for data storage. I got used to surface-mount components. Before this, I had always worked with through-hole parts. Through-hole electronic parts have wire leads that you put through holes on the circuit board. Then, you melt solder into the hole. This both makes the electrical connection and holds the wire in place. With surface-mount, however, the component has only metal patches for leads, or short pins. These connect to flat metal pads on the circuit board. 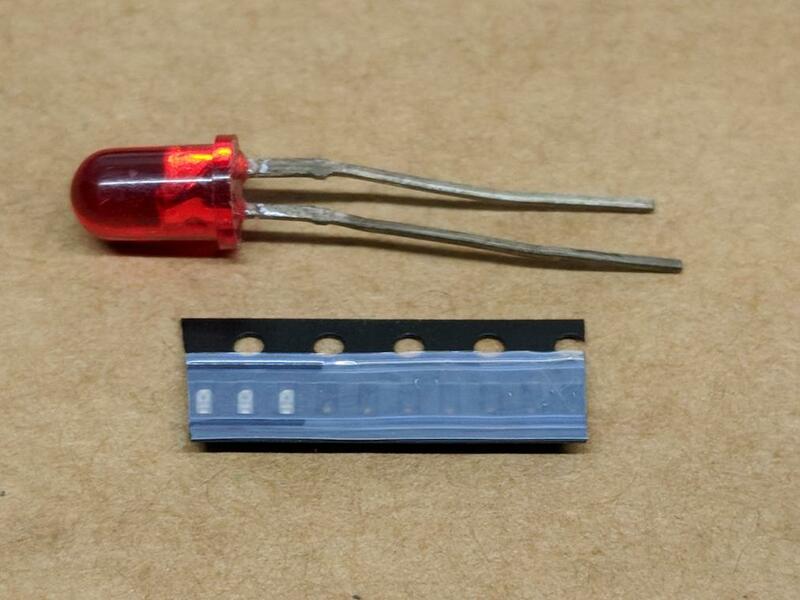 The solder acts as both an electrical bridge, and “glue” to hold the part on the board. Through-hole compared to surface-mount (SM) LEDs. The SM LEDs are the three pale patches in the carrier strip. Once in a real case, I hoped it looked less like a bomb. I called my device “Greenlogger”. I was doing this on my own, not part of any job. Of course I thought about eventually making some money off it, but I wanted it reliable first. So, instead of trying to sell them at this point, I offered to loan them out for testing. There is no substitute for real-world testing. I did not know if it would work to run the instrument in a totally sealed case. Maybe the electronics would get too hot, or there would be some other problem. But I decided to try. I rigged up some basic stands from PCV pipe. In field tests, the instruments worked, but I learned other things too! 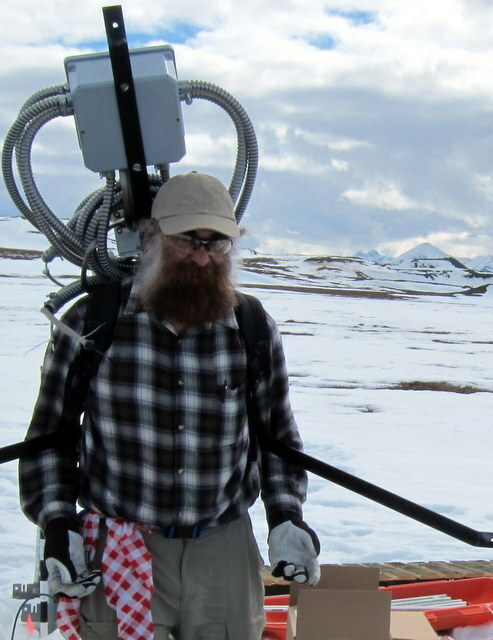 At one site, where researchers set Greenloggers out on Colorado’s Mt. Evans, at 14,130 ft elevation, animals tore the heads off. What else would leave teeth marks? So I had to re-design the mounts. In a few years, my Greenloggers were standing in the field next to mantises. The solar power was keeping them charged, so they could run indefinitely. The scheme I came up with to get the data by Bluetooth was tap-to-wake. Most of the time, the Bluetooth is shut off, to save power. When you want to communicate, you rouse the logger with a sharp tap. My design contains an “accelerometer”, which measures all forces of acceleration. A tap is a rapid acceleration, and so it’s the signal to wake up and connect. Overall, things were working pretty well. 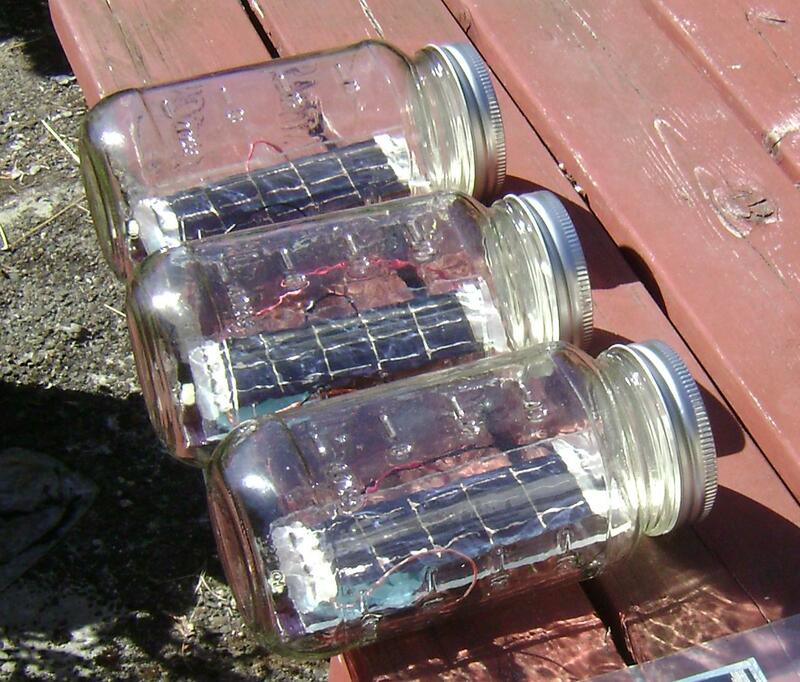 The light sensors were getting readings that spanned about 6 orders of magnitude, from moonlight to full noon sun. I put a temperature sensor on the circuit board. This would not tell much about the environment during the day, when the case bakes in the sun. However, it might give a clue if something failed. If an instrument died, and the temperature record leading up to that was climbing and climbing; well we need to figure out how to keep things cool. At night, though, the instrument temperature would drop to ambient, and the record would correspond to local weather. It’s important for an instrument to know what time it is. 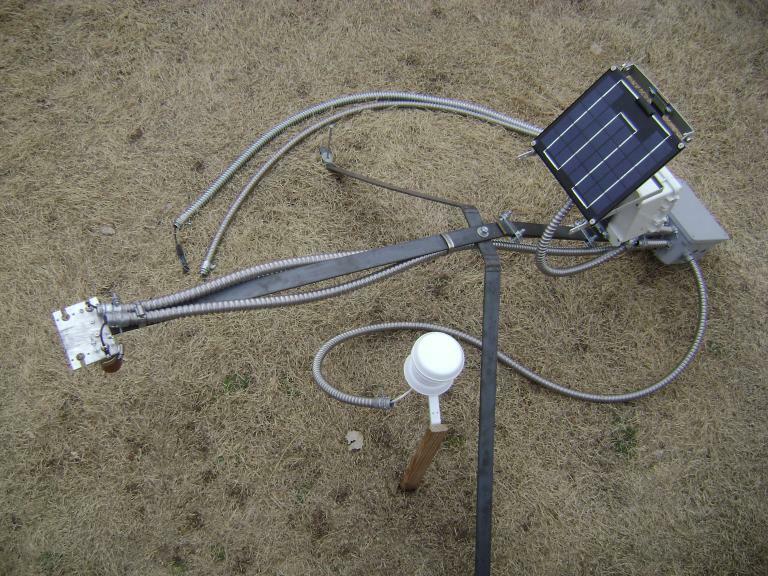 Each mantis was, essentially, a semi-mobile weather station. Weather stations need to timestamp their data. If, say, the temperature is recorded, but not when it was that temperature, well, that’s not much use. Commercial weather station instruments incorporate a real-time clock (RTC). This is like an embedded wristwatch. Modern electronics can keep pretty accurate time, to about a minute per month. 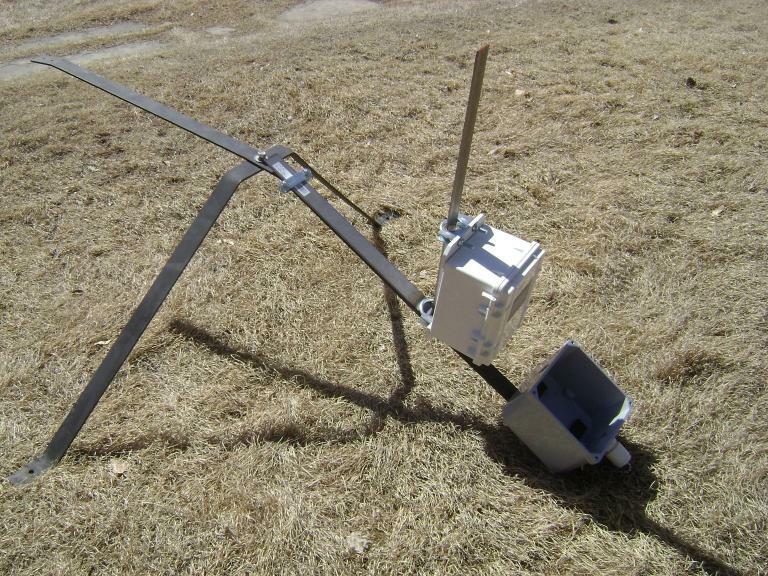 For the mantis weather stations, the RTC would be set during the initialization process, while connected to a laptop. After that, it’s understood that a free-running RTC can “drift”, that is, run a little fast or slow. To keep it accurate, you need to periodically correct any drift, and that means a field visit. I built an RTC chip into the Greenlogger. You can set the RTC by Bluetooth, so you do not need to open the instrument case. My prototypes kept pretty good electronic time, but of course there was the inevitable drift. This was not going to be good enough for months, or years, of unattended operation. Early on, I considered a doing it like radio clocks, which set themselves by the US standard time signal transmitted from Colorado, or perhaps use one of the European services. 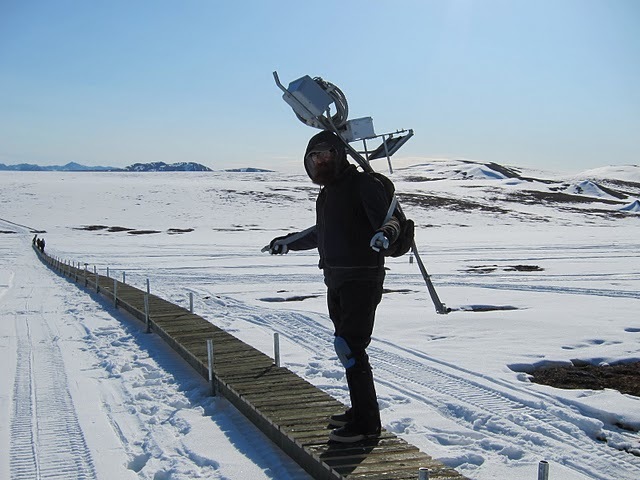 But my instruments might be deployed in far remote locations, out of range. I needed it to work anywhere in the world. I thought GPS would be the way, but it took a while to figure out. GPS works by triangulating on three satellites. The GPS receiver knows the distance to the satellites by very accurate time signals, so timing in inherent in the technology. GPS output contains this time signal, along with the location. A big part of the solution was simply the physical technology. A “GPS receiver” basically consists of a chip and an antenna. 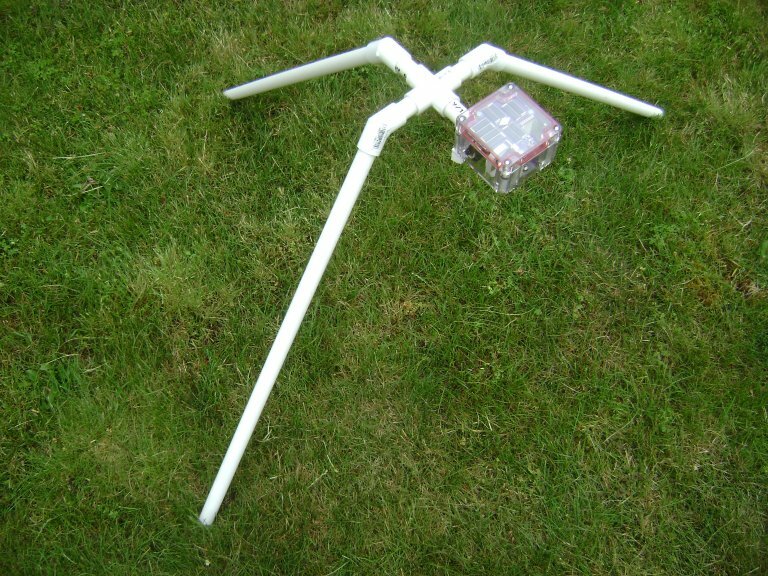 The antenna has to be good enough to pick up the faint signals from distant satellites. The chip (or chip set) handles all the complex math of extracting those satellite signals into simple usable data. Both the antenna and the chip posed serious conundrums in terms of size, cost, and power management in my design. The good news is that GPS is becoming so universal that the technology is advancing rapidly, and things are being mass produced. I could get the chips for under $10, in quantity. The antenna, however was another matter. 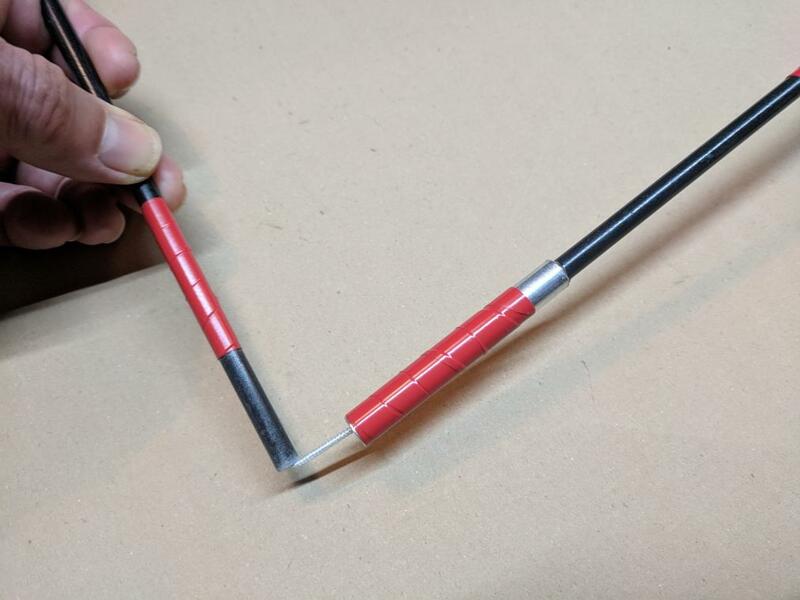 Discreet antennas are expensive, and take special connectors so as not to degrade the signal. Also, they are quite “big” as electronics goes. An integrated circuit chip can be shrunk to the size of a rice grain, because it does everything by microscopic transistors. However, an antenna has to be a certain minimum size to match the wavelengths it deals with. The GPS in your smartphone actually uses part of the internal metal casing for its antenna, but this is serious woo woo design, like doing acupuncture on a cricket. Fortunately, modules were becoming available that integrated the GPS chip right with an antenna, as well as all the onboard electronics. I designed in one of these modules, but then the company went out of business. This was right when I was putting some of my prototypes out for long term testing. So they had a “hole” in the board where the GPS was supposed to be. Other products came available, but they were bigger, and harder to interface. “Big” may not seem like much of a complaint when the thing is half the size of your thumb, but board real estate is precious. I had finalized my design to fit in a certain small plastic case. If I had to rework that, it would be a big step backwards. GPS is a classic example of “asynchronous”. For an electronic system to read, say, a memory chip, or a sensor, it just, well, reads it. This happens in a nanosecond, or at worst a few milliseconds. On the other hand, a GPS subsystem doesn’t just “have” the data you want. It has to go get it from the satellites. This can take a few minutes, or at worst half an hour! For my Greenlogger, this ought to be OK, because it just needs to correct for RTC drift maybe a couple times a month. But how to run that? I had found a new GPS module that would work, but controlling it was looking complicated. My main uC would be pretty busy: First, it would try to wake up the GPS. Then, check if the GPS actually did wake up. 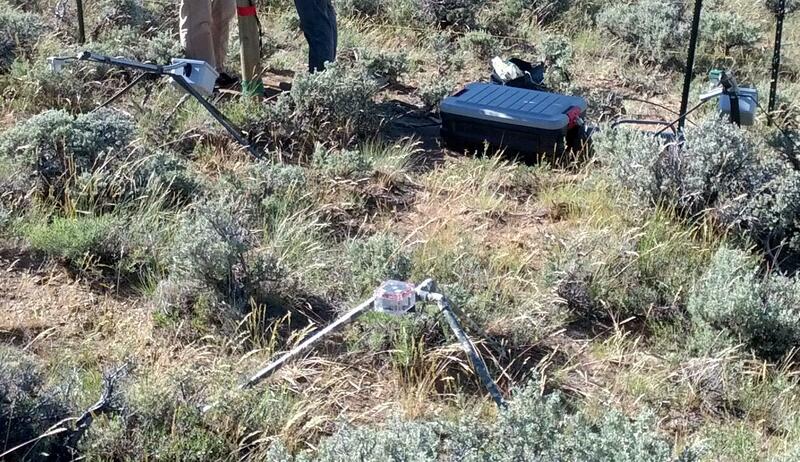 Next, see if the GPS is transmitting anything. If so, see if what the GPS is transmitting makes any sense. If it does, winnow through the firehose-spray of information the GPS is emitting, to see if we have got a time fix yet. If good, snip out this tidbit, and set the system time. Keep track of how long all this is taking. It could be, we are stashed in a metal file cabinet somewhere, and the GPS is never going to get a reading. If it takes too long, forget it. Gracefully shut down the GPS, whether we got a fix of not. Make sure the GPS is correctly shut down, so it isn’t leaking precious system power. If we never got a fix, peek out every now and again to see whether the project scientist has finally put this device outdoors under the open sky, where we can breathe! This would have taken about a quarter of the total computing power of the main uC, juggled in along with all the normal data logging. It would have taken a bunch of board space, and a rat’s nest of signal traces. I started toying with the idea to put all this on a separate board, with it’s own auxiliary microcontroller. 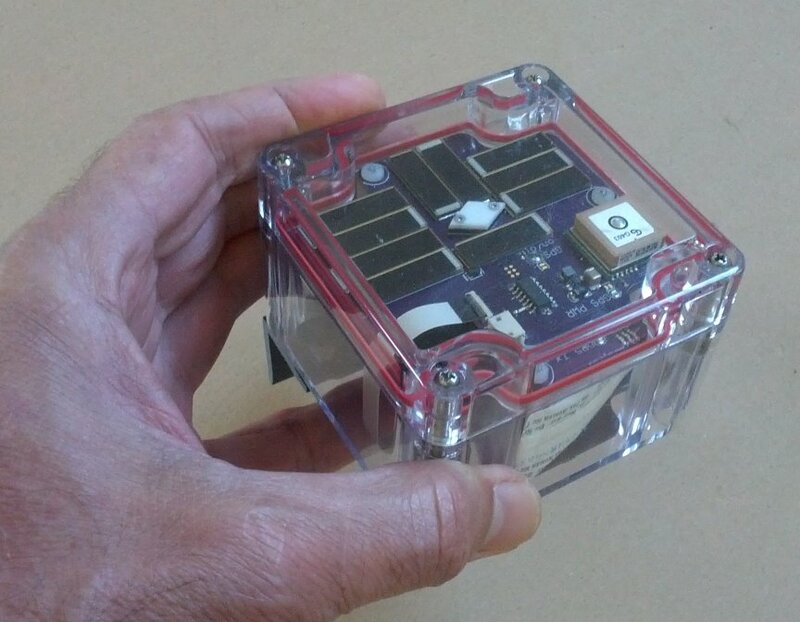 The GPS module itself was already on a separate board, in order to fit everything inside the instrument case. This turned out to be the solution. There is kind of a joke in microcontroller design, about sleep modes. Modern uCs feature a wonderful array of sleep modes. The uC can shut down functions to save power. But if a uC goes too deep asleep, so it isn’t doing anything any more, how can it ever wake up again? Kind of like the joke about write-only memory. But in this odd case, it was just what I wanted. The main uC chip sends one time-request pulse to the GPS uC, and then forgets about it. The GPS uC takes it from there. It handles all the waking up of the GPS module, babysitting it while it watches the sky for satellites, and patiently listens to it babble about what it’s seeing. If the GPS module takes too long, its uC puts it back to bed. But if all goes well, the GPS uC finally gets a valid time from the GPS, and sends it as a set-time signal back to the main system. This is the same signal you can enter, say from your smartphone, to manually set the time. The main system has only the relatively simple housekeeping, to keep track of how many days since it last got a time update, and periodically ask for a new one. Meanwhile, every time the GPS uC runs, it finishes by swallowing a whole bottle of sleeping pills. So it then uses no more system power. This is OK, because each time the main system wants a time signal, it brute-force resets the GPS uC, to raise it from the dead. After a number of design iterations, I finally had it so the Greenlogger could set its own time anywhere in the world. The GPS module added a somewhat uncomfortable $30 to the parts cost, but, well, how much would it be send a technician to, say, Greenland once a month for the sole purpose of updating the instrument’s clock? 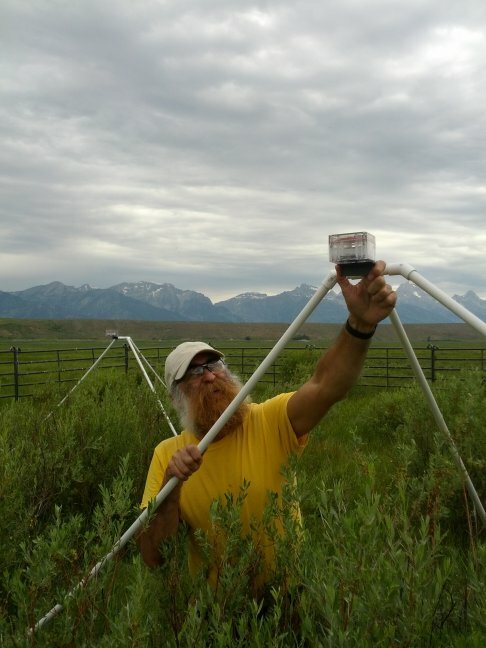 In spring of 2014, I had the opportunity to set out three Greenloggers for long-term testing, at remote sites in western Wyoming. In autumn of 2016, I went back to look for them. 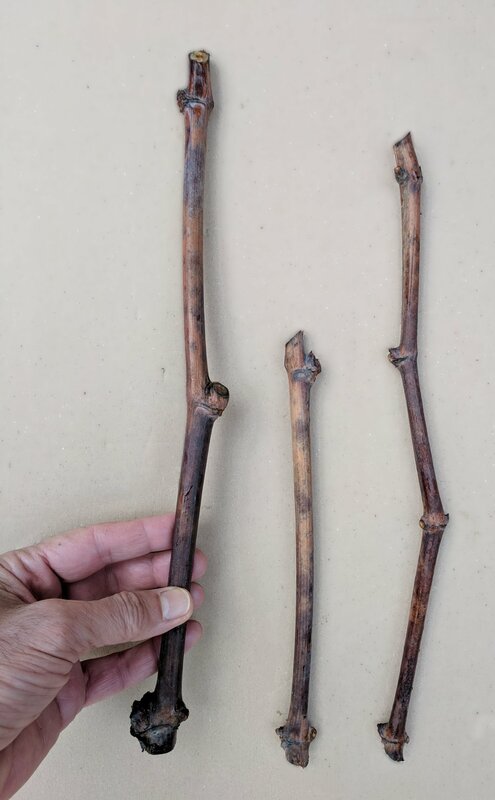 One had been stolen, but the other two had kept on running through two winters, recording temperatures down to -24 degrees Centigrade. In the winter weather, one of the instruments held a record of temperature staying at exactly freezing for about three days, with muffled light levels, indicting it was buried in snow. Then, as its battery ran low, it went into hibernation and stopped recording. It remained running in ultra-low power mode. 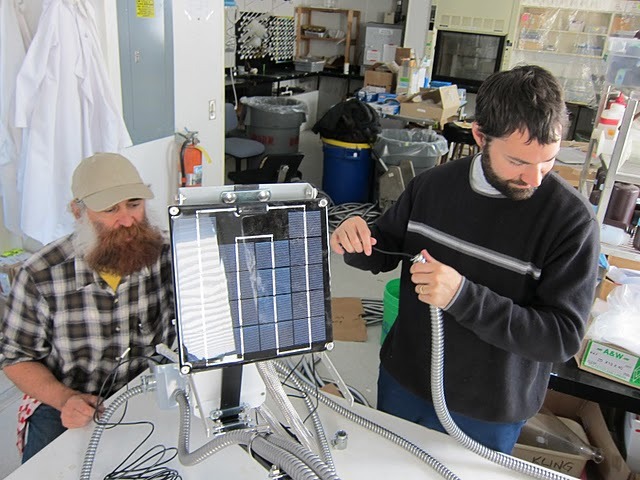 About ten days later, when it got more solar power, it woke up and started recording again. Overall, I was satisfied how robust they were, but this was in the gap when I did not have GPS working. After two and half years, both devices had serious clock drifts, of 4 and 5 months! So now, with GPS installed for automatic time setting, I have prototypes out for winter testing in Greenland and Alaska. I thought these loggers could be repurposed. For example, they already serve as solar site evaluators. They record just how much sunshine reaches a spot, day after day, through all weather. They also serve as trackers. One prototype I loaned, was shipped back to me, broken. From the log, I could see what had happened. I had packed it up to ship at 6:30 PM on June 25, 2017. After that, it recorded darkness. About 5 PM on July 11, it started detecting light again. It got a GPS fix, and corrected its clock by 31 seconds. It also recorded that it was now in Alaska, on a tongue of land in a small lake in the middle of Yukon Delta National Wildlife Refuge. Research collaboration plans change. A few days later, it recorded that it was at the airport in Durango, Colorado, evidently en route on a transfer to Greenland. On July 20, it recorded a location on Cape Cod, Massachusetts. That evening, it was dropped hard enough to reset. It lost its location, though the clock kept running. The same thing happened a couple more times over the next few days. On July 22, it was recording temperatures below freezing. Freezing in late July? Greenland! The light level traces showed the never-quite-dark summer cycle of the midnight sun. Then, on July 24, the record abruptly stopped. I received the device back August 9, shipped from an address in Maine. The battery clip was broken off the circuit board, evidently from impact. Repaired, in Portland, Oregon, it recorded the solar eclipse of August 21, 2017. Every electronic system needs a Reset button. To avoid having to open the instrument case, I had equipped the circuit with a magnetic reed switch. This works similar to how a strong magnet picks up a chain of paper clips. The magnetism travels through the iron, and makes normally un-magnetic pieces stick together. In the Greenlogger, you can bring a strong magnet close to a certain corner, and two tiny contacts, normally separate, will touch. Thus you can “press” the reset button from outside the case. It turns out other things can make the contacts touch, such as a hard slam. I thought about leaving this in the design, to determine if the scientists were playing softball with my instruments. But, no; if I want that I should program the accelerometer. Instead, I plan to replace the reed switch with a magnetoresistive sensor, which responds only to magnetism, not physical shock. I know of one more issue I need to fix. I call it the climb-out-of-reset hang. The commercial weather station boxes we used have this same problem. It is classic in energy harvesting designs. Say the battery drains down, and the system totally dies. When there is solar power again, the battery starts to recharge. There is an exact point of voltage when the system electronics are just barely able to start. They start, and try to run through their initialization routines. However, this small sip of power is enough to drop the battery back down below the critical threshold, and the system dies again. The battery recharges. The system starts — and the cycle repeats, forever. If you connect the system to a well charged battery, the voltage droops a little during initialization. But right after a successful startup, the system can go into battery management mode, and keep itself on a strict energy diet. However, on a slowly-charging battery, what the system really needs to do is hold off on powering up, at all, until the charge is well above the start threshold. But the system had no way to know how to do this — because it’s still dead. Since the system cannot rely on the intelligence of the uC, it needs some sort of hardwired holdoff circuit right up next to the battery. This is tricky because these “dumb” electronics have to work, and make critical decisions, based on fractions of a volt. Not much electronics works reliably on fractions of a volt! Everything else in this project was impossible, but now it’s working. It’s going to be really cool when the holdoff circuit is too! The mantis was developed under government research funding, and so is in the public domain. I wrote sections of the documentation, which includes instructions for data processing. We developed two tools for processing data from the mantises, Greenloggers, and other recorders such as iButtons. Categories: long posts, science, what's up | Tags: Alaska, electronics, environment, science, technical | Permalink. There is a huge amount of disinformation out there about how to grow fruit tree seeds. Rather than going into all that, this post is about how to do it. This is not even an experiment. I’ve been growing tree seeds for decades, and I know how it will turn out. This is more a test, to demonstrate the techniques. I saved a handful of apple seeds, from some random apples I used to make applesauce. Later, I’ll discuss differences in species and varieties, but ordinary apple seeds make a good demonstration. I divided the seeds into three approximately equal batches, of about 23 seeds. The first batch was the “control”, or no treatment. I planted these in a pot of dirt, same as you might plant flower seeds. This was on January 22, 2016. I kept the pot moist, in normal warm room temperature. At the end of the test, May 4, 2016, there was no difference. Not one had grown. If you try this with a large number of seeds, you may have one or two random seeds sprout, but this is not the way . Next, the “freeze” batch, I put overnight in the freezer. The next day, I put them in a small ziplock bag with damp sawdust, and stored them in the refrigerator. I checked on them periodically. In this check on April 1, 2016, none have grown. At the end of the test, May 4, 2016, none had grown. Looking close, the moisture around the seeds is becoming milky. The seeds are starting to rot. They are dead, and have been since they were frozen. This is one of the misunderstandings. People hear that seeds need cold to germinate, so they freeze them. As if freezing will “break” dormancy, like shattering ice. No. If seeds are completely dried, some species can survive deep cold, but it only holds them in suspended animation. It does nothing to make them germinate. Usually, it just kills them, as you see here. For the “chill” batch, I put them in a ziplock sandwich bag with a little damp sawdust. I put this bag in the refrigerator. These seeds need moisture and oxygen to germinate. Polyethylene, the plastic most ordinary plastic bags are made of, is permeable enough to oxygen that this works fine. You can zip the bag closed so the seeds don’t dry out. You do not need to leave the bag open. In this check, on April 1, 2016, you can see that some seeds are starting to germinate. Germination is a gradual thing. I judged that a seed had “germinated” if the root tip coming out was longer than it was wide. So, on this date, I counted 3. In the next check on April 15, 2016, more had germinated. I replaced the sawdust with a damp paper towel, to make things easier to see. This works just as well as sawdust. If you don’t need the see the seeds, you can use peat moss, sand, soil, crumbled up autumn leaves, etc. If you’re doing a lot of seeds, you can mix them in the bag, and then plant the whole mix once the seeds are germinating. If you count the seeds, you will notice I did not put back the 3 that had already sprouted. The purpose was to demonstrate germination, not to grow the seeds. If you want to grow the seeds, you can plant them as soon as they sprout. They don’t need cold any more. In fact, cold only slows them down. This is natures way of easing the seedlings into springtime. Chill breaks their dormancy, but then the cold temperatures keep them growing slowly, so they don’t pop up and get hit by late frosts. Going by my criteria, I did not count the seed in the lower right corner to have “germinated” yet, as its root was not long enough. So I counted 5 more germinated on this date, for a total of 8 so far. But as you will see, it makes little difference in the final tally. By May 4, 2016, all the rest of the seeds had germinated. Here’s the numbers on this test. None of the seeds grew except those in the “chill” treatment. The magic is holding the seeds at a temperature above freezing, but below about 40 degrees Fahrenheit (4 degrees Celsius). Your ordinary home refrigerator is the correct temperature range. How do you know? If it were too cold things would freeze and if it were too warm your food would go bad. If your refrigerator is working normally, it’s perfect to cold-treat seeds. This is what has happened when you cut open and apple and find seeds sprouting inside. The apple was kept in cold storage, and the period of refrigerator temperature satisfied the seeds’ chill requirement. The seeds need to be imbibed with water, but not under water. Immersed in water, they would not get enough oxygen. These are like the conditions a seed would find, buried in the surface layer of soil, through the winter. Even in continental climates, where air temperatures go extremely low, the soil a short distance below the surface seldom freezes so cold. Here are the numbers on the “chill” treatment, with the dates translated into elapsed time. Chill requirements for plants are often expressed in hours, so I’ve included the elapsed time expressed as hours as well as days. Notice that nothing visible occurred for more than a month! It’s as if the seed has a little hourglass inside, which runs down while the chill conditions are met. If it’s too warm, the hourglass stops. If it freezes, the hourglass stops. But after enough accumulated hours, the seed grows. Notice that this is not abrupt, but in most batches of seeds, once it starts it goes pretty quick. This is how nature hedges her bets. If some seeds came up too early and got killed, there would be stragglers to take their place. On the other hand, if the early ones got a good head start and took over more space, the next generation would drift towards lower chill. In tree species that have a substantial north-south range, local populations have adjusted themselves to the best chill requirement for their conditions. Plants use the same chill mechanism to “know” when to leaf out. It correlates with seed chill. That is, for two of the same kind of plant, except with different chill requirements, the one that needs less chill to germinate from seed will need less chill to start leafing out each spring. All else being equal, it will bloom earlier too. This explains why certain fruits are notorious for getting their blooms frosted. Peaches have a low chill requirement, and apricots even less. Evidently they originated in parts of the world with cold winters, hot summers, and not much transition (chill) in between. Brought to North America, where the weather has all sorts of wild swings, they get their chill requirement at the first breath of spring. They bloom out, then get snapped by late frost. Why haven’t they adapted? They never needed to. If you grow these seeds, you will find them very “easy” to germinate. Everyone who ever cultivated them did too. The grower planted a bunch of seeds, and the first sprouts to pop up tended to get planted out in the orchard. This, of course, selected for low chill. The trees did well enough, and if the blooms got frosted too often, well, that region would not be known for apricot production. If you wanted to develop, say, a late-blooming apricot, you could use this approach. Plant a lot of seeds. Say you want ten trees. As the seeds germinate, pot them up, but when the eleventh one germinates, pull up the first one and plant the eleventh one in its place. Keep on doing this. Eventually, you will end up with the slowest to germinate, high-chill individuals. It might take generations, but finally you would have a late-blooming apricot. This chill technique for germinating seeds works for most mid-latitude tree crops: apples, pears, peaches, apricots, cherries, plums, persimmons, almonds, chestnuts, walnuts, hickories, etc. It may be hard to believe a tender root tip can break its way out of a rock-hard seed like a peach pit or a walnut, but it does. Most trees that ripen their seeds in the fall need chill. These include ashes, beeches, and some maples such as sugar maple, Norway maple, bigleaf maple, and vine maple. Tree seeds that ripen in the spring tend to have no chill requirement. They are ready to germinate as soon as they fall. These include elms and certain other maples like silver maple, and red maple. A number of leguminous (bean family) trees, such as locusts and mimosa (Albizia), have no chill requirement. Instead, their germination is inhibited by a water-impervious seed coat. This chill technique is sometimes called “stratification”. This is from a traditional method of putting layers (“strata”) of sand and seeds in flowerpots or lath-bottom boxes, and leaving these sunk in the ground over winter. You can see why it works. Winter moisture keeps the seeds imbibed. The upper layers of soil maintain the proper chill temperatures. The sand makes it easy to separate out the sprouting seeds when it’s time to plant them in nursery rows. If you do it this way, put bricks or something on top of your flowerpots, to keep squirrels from messing with your seeds. Seeds that need chill will, of course, germinate just fine planted directly outdoors in the fall. However, there is liable to be a lot of grass and weeds also growing by spring when they come up. You may have a hard time spotting the seedlings, or remembering where they were. If you want to grow a lot of seeds this way, plastic bags may be easier than pots. Collect up your seeds as they come along, and keep them so they do not completely dry out. For example, cherries ripen in early summer. As you use the cherries, put the pits in some loosely lidded container or a plastic bag with something to keep them a little damp, such as moist sand, soil, peat moss, dead leaves, or sawdust. If you put them in the refrigerator in the summer, they are likely to have their chill requirement met by fall, and germinate as winter is coming on. If this is what you want, growing them indoors all winter, go for it. But for a more natural cycle, put your seeds in a plastic bag and bury it a little below the ground surface, or under some dead leaves or sawdust. Then, the seeds will stay at ambient summer temperatures until autumn, and their timers will not start running down yet. Be sure you have your seeds buried before things freeze hard. One time, I had a bag of peach pits out on top of the ground, and a November cold snap went to single digits. All these seeds were killed, but the ones buried just a few inches were fine. As autumn comes, the temperatures will start dipping into the chill range at night, and the seeds’ timers will start ticking. As the weather gets cooler, the seeds will accumulate more chill hours each day. In midwinter, the seeds may go slightly below freezing, and their timers will stop. But as spring comes, they will resume. As each seed germinates, it will start to put out a root. Keep checking them. If left too long, the roots will be all tangled together, and the seeds will be hard to separate out to plant. Categories: botany and horticulture, how-to, science | Tags: botany, gardening, outdoors, seeds | Permalink.